Buy My Photos Of Paxos? Coming Soon! Antipaxos is a very small Greek Island. Small but stunning and we have loved both our visits. Antipaxos Greece – as I said a stunning, very small Greek Island that we visited twice, and absolutely loved each time. 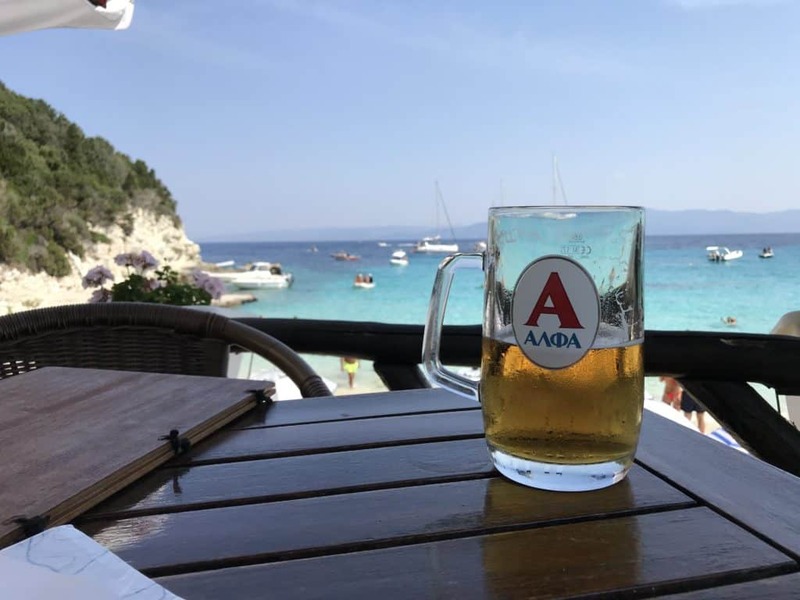 In this post I will tell you what it is really like going to Antipaxos for the day and provide information on everything that this wonderful tiny Greek Island has to offer. At the end of the post are links to related things on my website that I think you might find of interest. So if you have already booked a holiday to Corfu or Paxos, or are thinking about it, and fancy a day out somewhere different then why not add Antipaxos to your plans? If you hear about comparisons with the Caribbean and Caribbean-esque beaches and translucent blue, green and turquoise seas then this is true – I have been to both and Paxos really does compare. Why should I go to Antipaxos? Well why not? Antipaxos offers stunning beaches with stunning crystal-clear aquamarine waters. 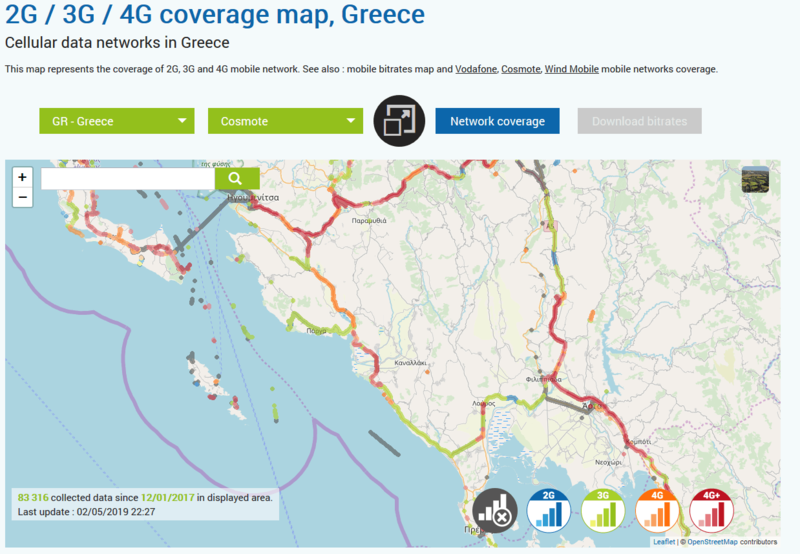 Here is a map that shows mainland Greece, Corfu, Paxos and Antipaxos. Antipaxos is just under 2kms to the south of Paxos in the Ionian Sea. The trip from Gaios to Vrika Beach is longer of course, but the 2km is the extent of the bit of open sea between the two islands. From top left to bottom right Antipaxos is 3.90km long, and at its widest point is 1.68km wide. That equates to just over 4km2. That is pretty small isn’t it?? And Antipaxos has a population of less than 100 in the high season, dropping as low as 30 in the close season. 30 people on an island – just think about that! When is the best time to go to Antipaxos? Well that is simple. Check out my post When Is The Best Time To Visit Paxos? which will tell you all you need to know. 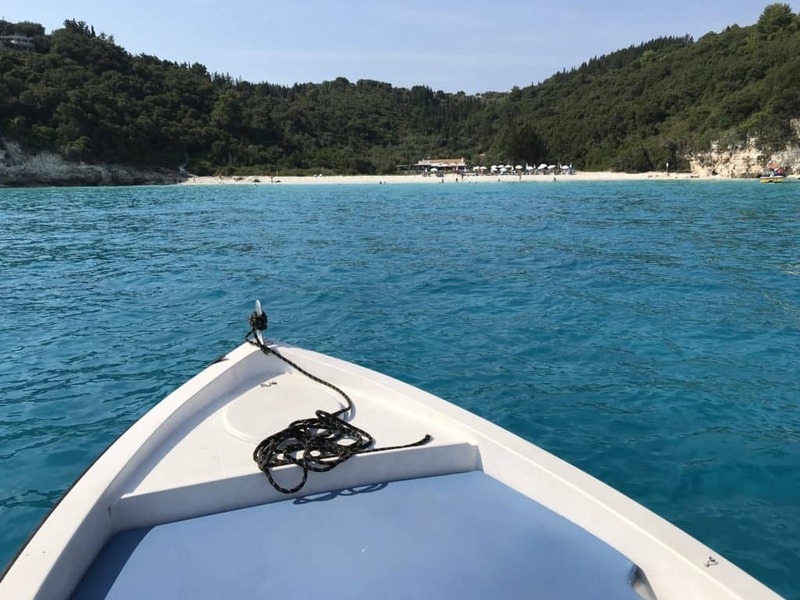 The island of Paxos is quiet in the close season, and I would imagine Antipaxos is even quieter – I have never been there off-season so cannot say for sure, but I would imagine that Antipaxos is pretty much deserted on the close season. 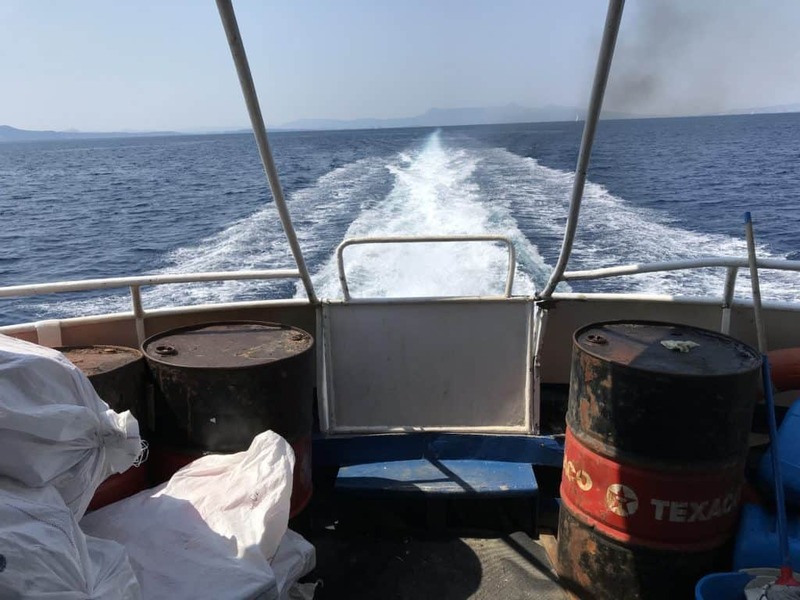 Certainly there will be a much-reduced boat service from Paxos to Antipaxos. And I can’t see any of the restaurants staying open either. Now I have to say that writing this makes me wonder if it is possible to go to Antipaxos outside of the main holiday season on Paxos. It sounds like an exciting and different thing to do, which I fear I am going to have to look into and try to do! 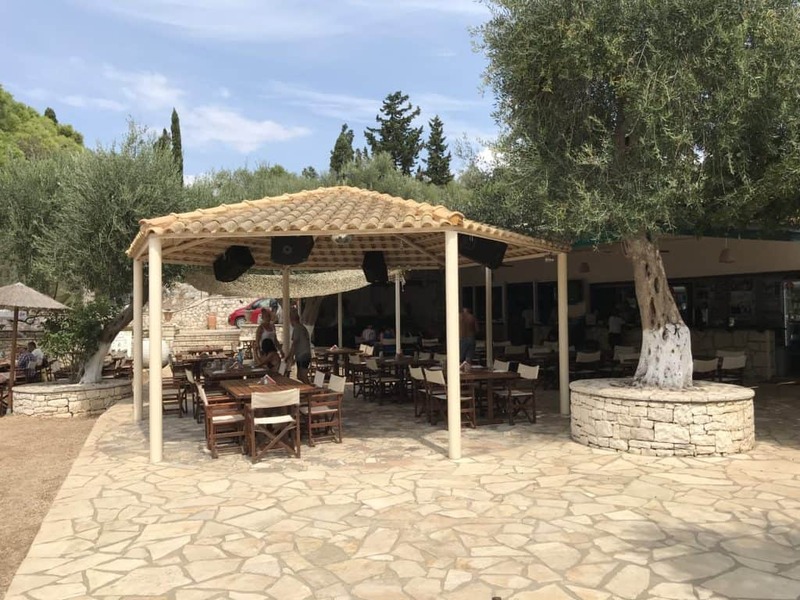 The tavernas on Antipaxos may not even be open at the beginning of the tourist season in May, nor the end of the season mid to late September, giving a small window of opportunity. Off season does not look good. The only way to Antipaxos is by boat. Well unless you are a particularly strong swimmer that is! Or have a sea plane or helicopter. Ok I will stop there- you get the point? There are day trips mainly from Gaios, as well as daily water taxis from Gaios to Vrika and Voutoumi Beaches which run from mid-June to mid-September. Water taxis only take 10-15 minutes to get you from Paxos to Antipaxos and back. And if you are one of those lucky people sailing around the Ionian Islands you can moor up and hit the beach and bars whenever you want. Other than that it you have managed to secure one of the few holiday resorts on this wonderful island your tour operator will get you to your accommodation. Let me share my experience with you here. Getting across the open water from Paxos to Antipaxos is not a problem. Getting off the boat and onto the island can be though. 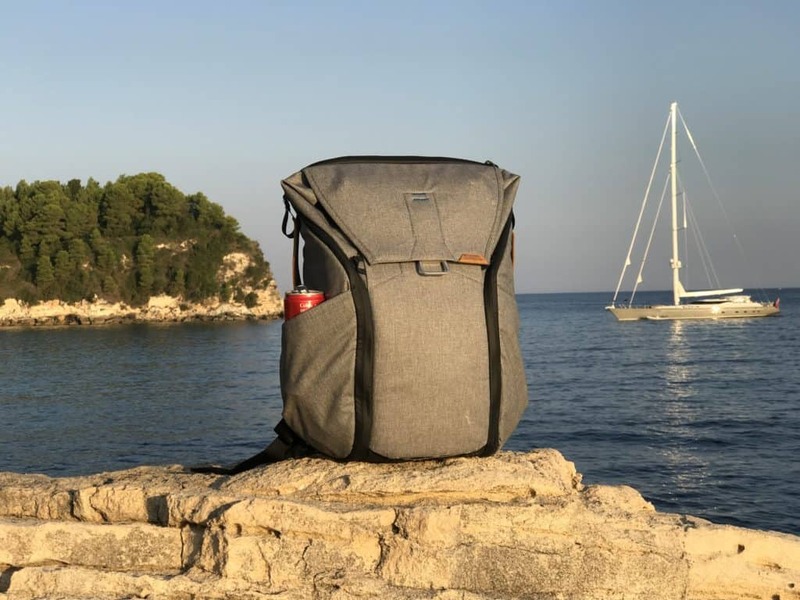 This is what I ended up doing – this is the bit you need to know – how to get quickly and safely on and off Antipaxos without annoying anyone. 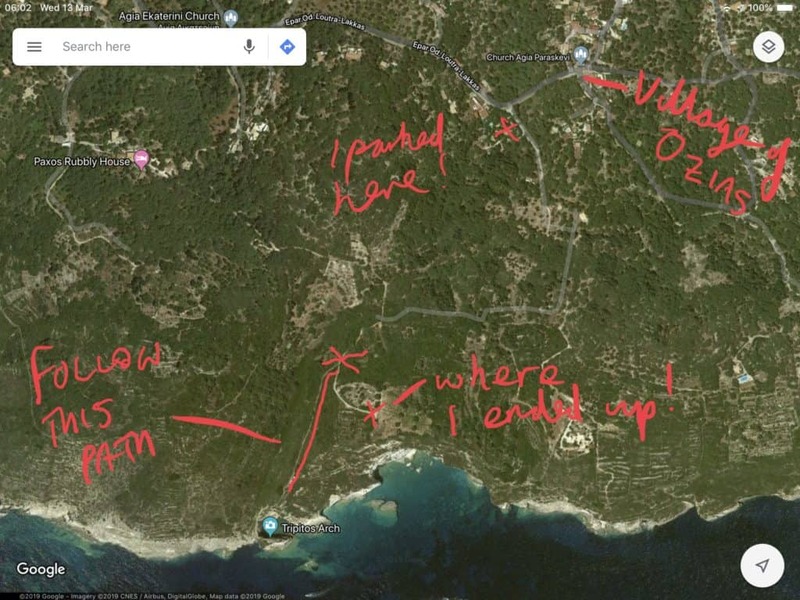 You can read all about the trauma of my incompetent attempts to do this in the post Paxos Boat Hire – Do Your Own Trip From Paxos To Antipaxos. I will spare you that tale of woe and cut to the chase. Take the boat slowly into the bay – you can’t miss Vrika Beach and Taverna Spiros on the right-hand side. Head to the right of the bay and you will see the platform where people get on and off the water taxis. Wait for the water taxi to leave, then quickly take your boat in and pull up at the landing. Holding onto the side drop off your passengers and all the bags, then turn the boat around and head of for the sand and drop anchor. It is a quick swim back to the beach, and everyone is on the island with no dramas. And I will give you one more top boating tip that will help you – bring a small waterproof container that you can out the boat key in. Preferably something that you can attach to yourself that is brightly coloured and floats. And don’t take loads of stuff. I took my full camera bag with me which caused all sorts of problems! What is there to do on Antipaxos? I have listed the main beaches elsewhere in this post. The beaches are lovely sandy beaches. Just go and enjoy! The water is stunningly clear. I like to just float in the water there to be honest. Get over to the rocks on the side an you never know what you will see – the beauty of that lovely clear water is the visibility when snorkelling is amazing. There is a dive site on the even smaller island of Daskalia, which can be found about 900 metres south of Antipaxos. There are two dive centres on Paxos, Paxos Oasi Sub in Lakka, which I walked passed at least 6 times every day on holiday as it is just past the Hotel Bastas, and Water Planet Dive Centre in Gaios. There is no dive centre on Antipaxos. Other than the tavernas there are no shops on Antipaxos! Obviously the island is small but walking into the centre of the island is well worth the effort, and you can take in Bella Vista on your way! And who does not love a gentle scramble on the rocks of the coastline of these islands – I know I do. But be careful on those rocky edges! Yes you can drive on Antipaxos, but this is only if you are staying there and really feel the need to! If you walk at a reasonable pace of 4kms per hour you should be able to get from the top to the bottom in something like, erm 20 minutes! And getting from side to side will be even quicker. So driving in Antipaxos? I don’t think so. And where would you get fuel from? These are the beaches of Antipaxos. 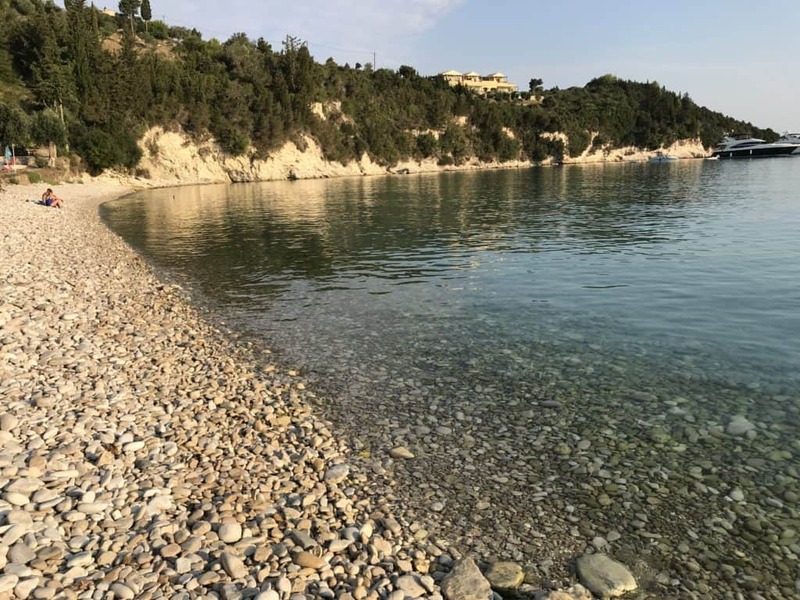 As with my description of the beaches of Paxos, which you can read in the post imaginatively called Paxos Beaches, I will start at the top of the island and work round in a clockwise direction. There are three main beaches on Antipaxos. One of the two famous beaches of Paxos, Vrika Beach has the lovely soft white sand and that Caribbean-esque stunning water. Vrika beach has two tavernas which you can read about later on in this post. I am sure that there used to be three places to eat and drink on Vrika Beach but there only appear to be two now. Or am I imagining things? This is the less well-known beach, the pebbly beach in-between Vrika and Voutoumi beaches. There are no bars, and the beach is pebbly. So it is much much quieter, and if that is your kind of thing go for it and enjoy that lovely water and everyone going past on the boats to the busier beaches. And it is a quick 5-minute walk to either of the other beaches with the facilities and all those people! 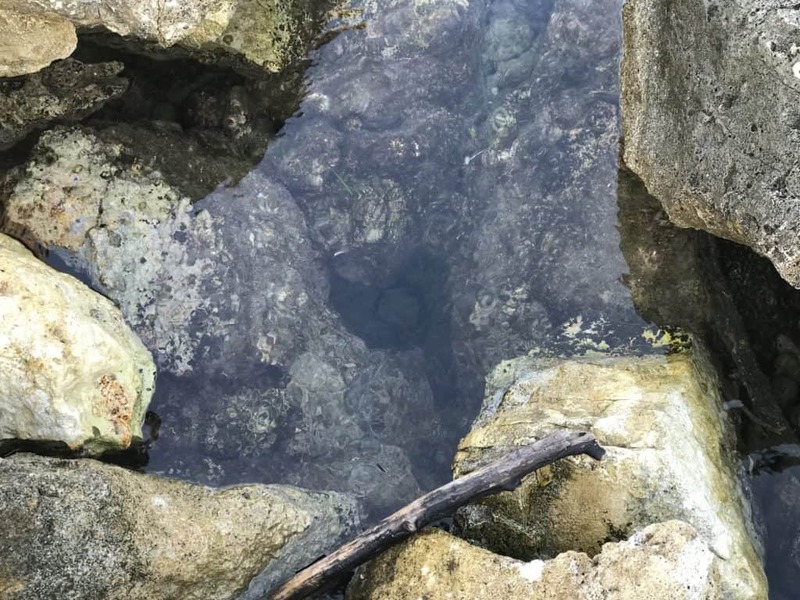 There are rocks at the ends of the beach which offer great snorkelling opportunities. Meso means “middle, intermediate, halfway” by the way. And I guess Mesovrika is the middle beach of three. Smile and wave and enjoy the peace and quiet of this lovely pebbly beach! Voutoumi Beach is the largest beach on Antipaxos, and along with Vrika Beach is one of the most famous beaches in the Ionian Sea, and possibly further beyond. Voutoumi Beach has that lovely white sand, and that ever so stunning blue water. Apart from these beaches there are a number of smaller beaches which do not appear to have names. I have to say that I have not been to these beaches, but they are (apparently) all accessible on foot, or much better by boat. 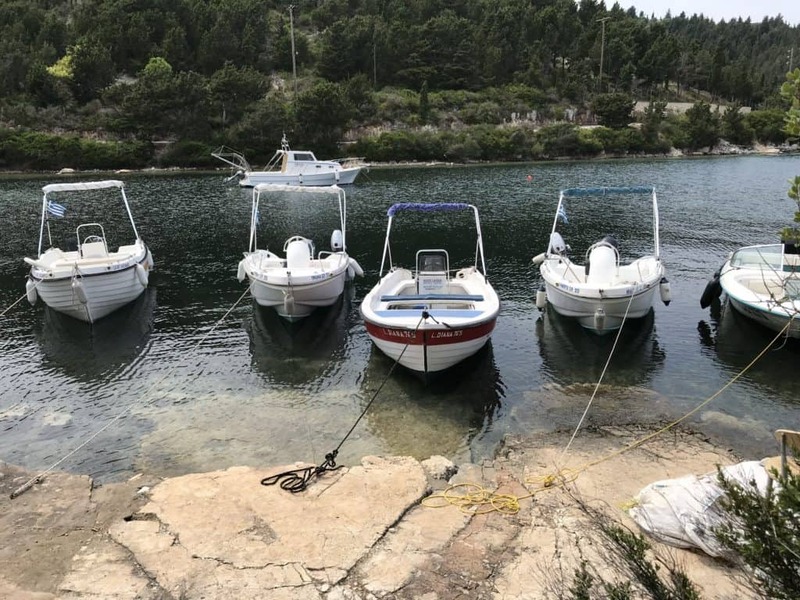 On the north west side of the island you will find Bay Antipaxos, which is a very quiet bay accessible from a small path or you can moor your boat in the bay and swim in the lovely crystal-clear blue waters. Why is the water so blue on Antipaxos? 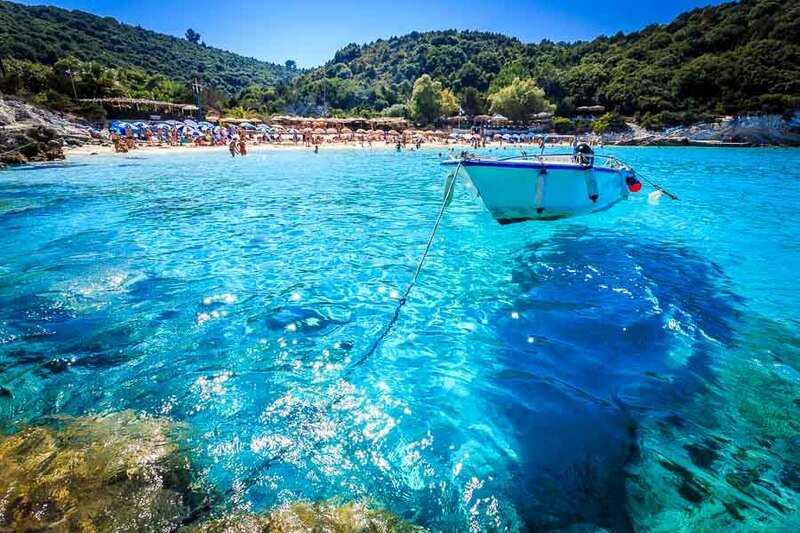 It is a combination of the nutrients in the sea, the depth of the water, the protection on the west coast of Antipaxos, the tides, prevailing winds and that lovely white sand that all combine to give the beaches of Antipaxos their stunning, crystal clear blue waters. I have often wondered why the sea is so blue and having looked into it believe it is a combination of all these things leading to this natural phenomenon. Shops. There are no shops on Antipaxos. Tavernas. There are five tavernas which are open at lunchtime. I list these elsewhere in this post. Hotels. There are no hotels on Antipaxos. No hotels!! And that is pretty much it. Bear this in mind – stopping on Antipaxos is going to be a different, secluded and quiet experience! Check out this fantastic Simpson Secret. You are provided with a Suzuki Jeep to drive around the limited roads on the island but remember how big the island is – I am sure that the bicycles provided will serve you just fine! This really is a wonderful retreat which I am seriously thinking about for 2020 – it is pretty much fully booked for 2019 (at the time of writing this post in April 2019). This is one of the two main bars on Vrika Beach. Sat right on the beach this is our favourite taverna on Antipaxos which we have stopped at on both our visits to Antipaxos. 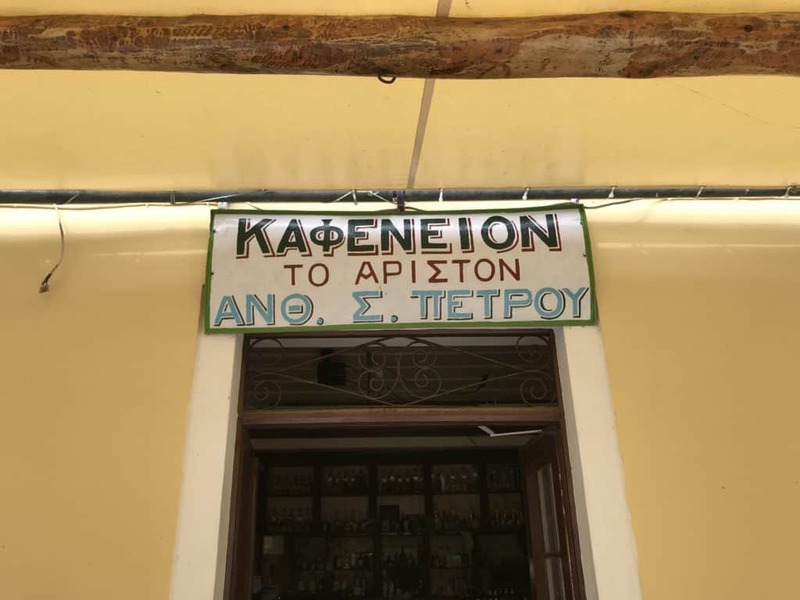 Now you might expect to pay a premium for eating and drinking on Antipaxos, but the prices are Taverna Spiros are just fine, the food is lovely, and the drinks are chilled. Meat is cooked on a barbecue which you walk past as you enter the seating area which is up a few steps giving the taverna a slightly elevated position offering fantastic views of the beach, the bay and that stunning water. Here you can sit and happily watch the world go by, and watch the boats coming in and out of the bay. Of course at peak times in the peak season it can get busy, so make sure you allow yourself time – do all this and you will have a great time there. We liked it so much we bought a t-shirt there happily advertising the taverna!! And talking it t-shirts this is were I left my t-shirt that time that I drove the hire boat – you can read all about that in the imaginatively titled post Paxos Boat Hire – Do Your Own Trip From Paxos To Antipaxos. The end point of this story is that we had a chat with the people at the Mongonissi Beach Bar and were reunited with my t-shirt at Theo and Pepe in Gaios some days later! And that is what Paxos is all about for me – a small, close community happy to help wherever they can. 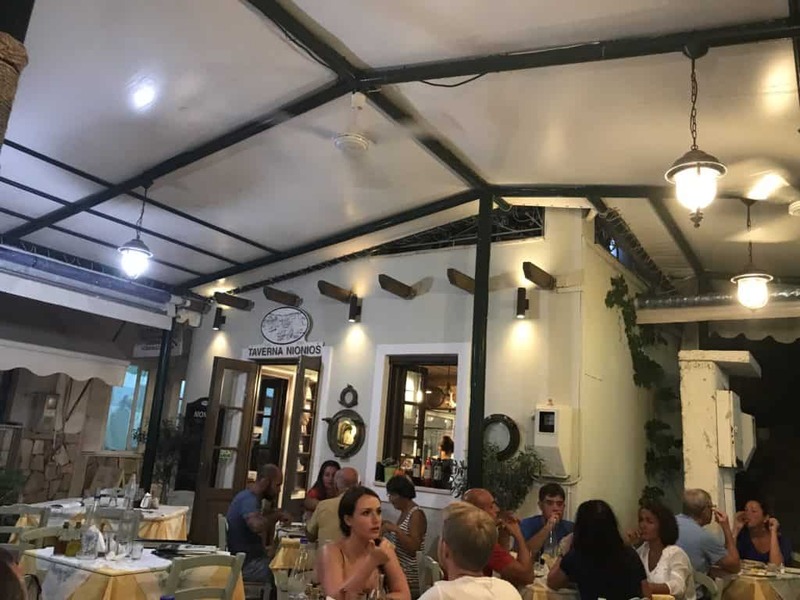 I believe that Taverna Spiros is the most popular restaurant on Antipaxos and has the best reviews if you check out Google and Trip Advisor, edging out Bella Vista. This is the other bar on Vrika Beach. This bar is down to the left as you look at Vrika Beach. 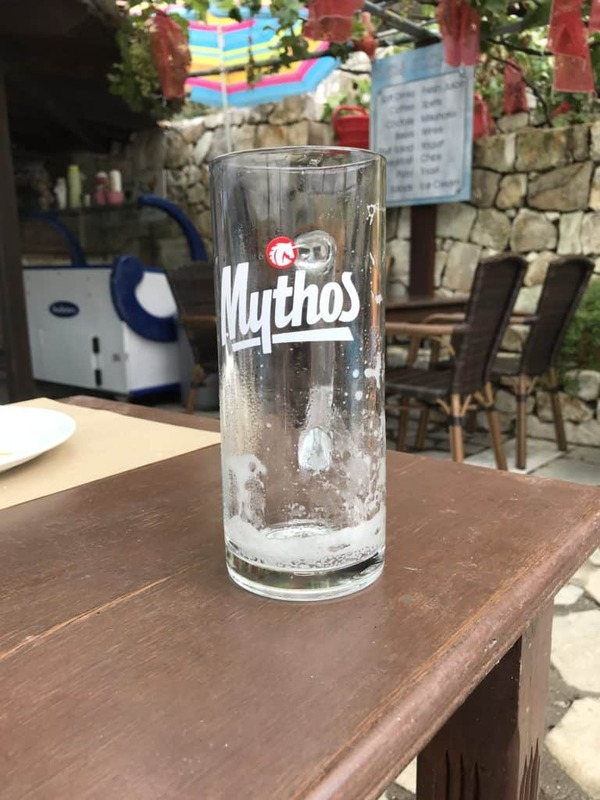 We have not been there to be honest, but I hear from people that I have spoken to that it is very nice and can be quieter than Taverna Spiros. Voutoumi Beach is the other main beach on Antipaxos. I have not been to Voutoumi Beach Bar – there is unfortunately only so much you can achieve in a day, especially if you want to have any relaxing at some point in the day!! A lovely beach location with views of that stunning (I will use the term again) Caribbean-esque sea and sand combination! This is the restaurant a short walk up the hill with great views looking down on Voutoumi Beach. How many steps appears to be a subject for debate – I lost count but there are 200-220-300 who knows? steps. One thing I can categorically say is that you walk up steps to get there. Bella Vista after all means “beautiful sight”. You can get dinner there, but the service does not run late into the night, they often have the last service at 8pm. And reservations are recommended, especially if you consider the lack of alternative options. At Bella Vista you will enjoy great food, a friendly service and also great music! Should I drive a hire boat to Antipaxos from Paxos? When is the best time to visit Paxos? And also please check out my Paxos Travel Guide YouTube Channel. I have a hire car. I am on Paxos. I have time. What to do? What is my number one thing to do on Paxos? 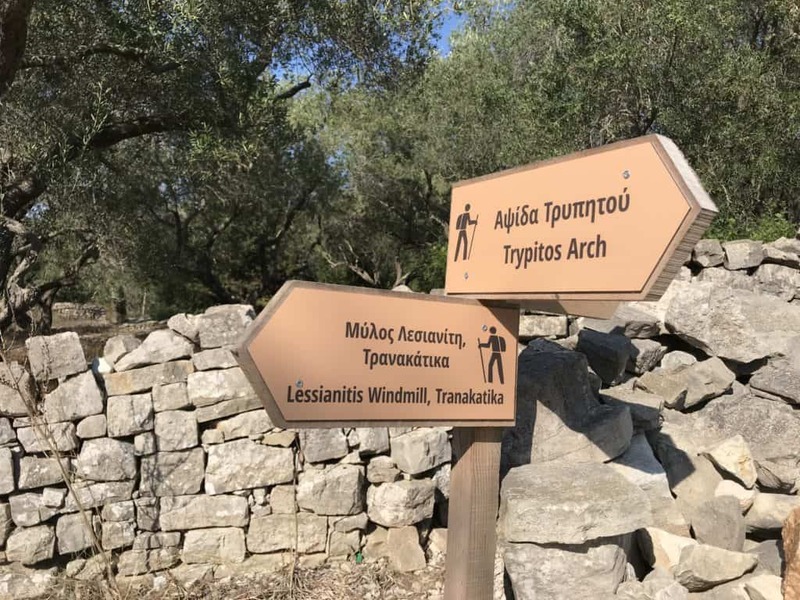 Visit the Tripitos arch – that is top of my list of things to do on this wonderful Greek Island. And that is what I am going to do. In this post I will tell you everything you need to know about the Tripitos Arch, and what it is actually like going there. I will include photos and videos, and also a marked up map showing you where things are. But first, let me tell you some stuff about the Tripitos Arch on Paxos. What is the Tripitos Arch? 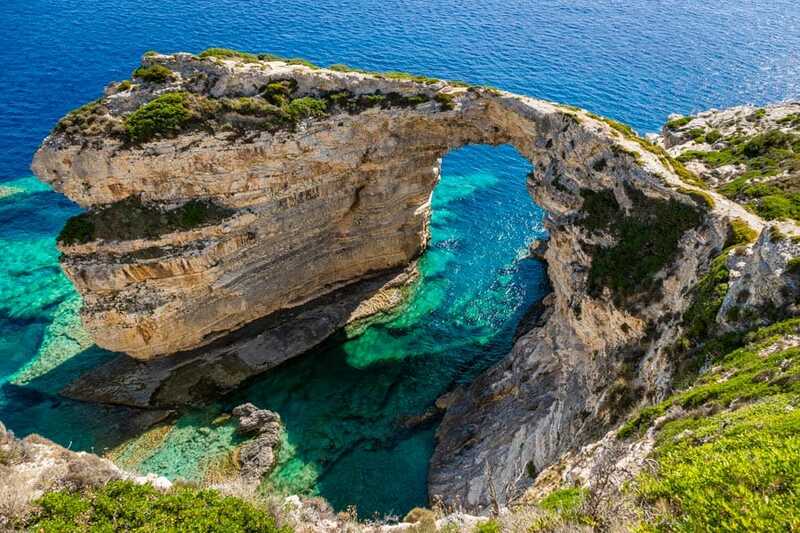 The Tripitos Arch is a magnificent naturally formed rock structure on the west coast of Paxos at the southern end of the island. It is over 20 metres high, and has magnificently clear waters around it’s base. The Tripitos Arch is the remains of what was once a sea cave. Knowing that makes perfect sense when you are actually there. As to when it was formed no idea. A long old time ago to be sure. If anyone finds this out please let me know! 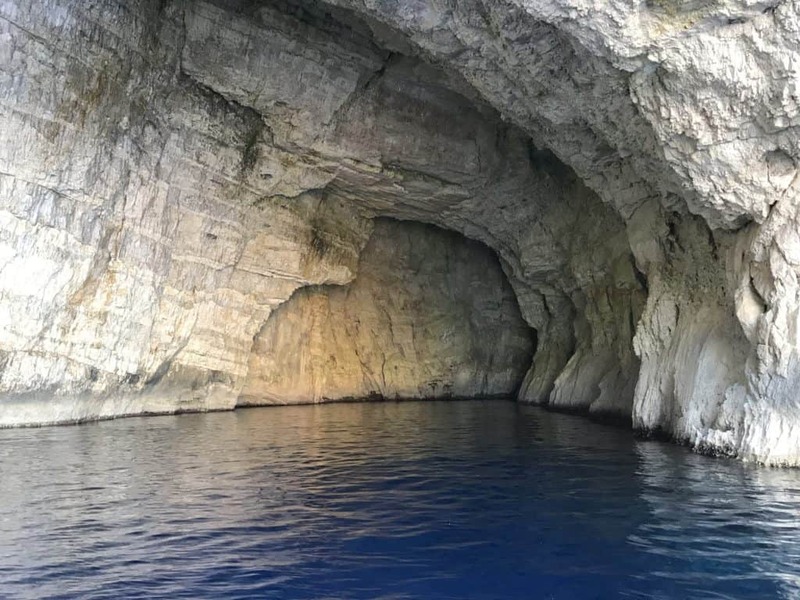 I can picture myself in that enormous sea cave, like the ones that you can see on the west coast of Paxos on a boat trip from Lakka down to the arch and onwards to Antipaxos. Where is the Tripitos Arch? Here it is on a map. Along with everything I have learned getting there! It is located on the west coast of Paxos, right down at the bottom. What are the roads like getting there? The roads are ok. You run out of tarmac road some time before getting there, so take it nice and slow to avoid punctures and damage to the suspension, but the roads to the parking are perfectly navigable. This is a video of the road you drive up (beyond where I parked) to the arch. How do I get to the Tripitos Arch? You can get to the arch by car and walking, and also by boat. If you are taking the west coast route down Paxos to Antipaxos you will come across the Tripitos Arch just before you make the crossing over to Antipaxos. By car you drive through the village of Ozias, and park as close as you can. I have marked on the map Ozias, and also where I parked, and the path that I took to get to the arch. When I say you can get there by boat you can get close to it by boat, but I would not risk getting off a boat and onto the rocks to be honest. Not that I thought of this when we passed the arch in our hire boat earlier on in the fortnight. You can get pretty close on a boat though, and look up at the marvellous rock formation – just be careful navigating the boat. Yes, there is free parking close by. There is no car park, you just have to get as close as you can and then navigate your way there. I have marked on the map where I parked (rightly or wrongly). Nothing. There is no one there to give any money to. It is completely free. There was no one there at all when I was there. There is no hut with someone sat there selling tickets and souvenirs- just a path to the arch. Is it easy to find? Sort of. I am an experienced walker and map reader and I got lost the first time I tried to find the arch. Once I knew where I had gone wrong it was easy though to be fair. So yes and no! Hopefully this post will help you get there. And the signage getting there is not great either. Not great at all. If you look at the map the red cross shows the final path that you have to take down to the arch. It is up to you how you get there, depending where you park. This is the critical bit that I missed with no real directions and no phone signal. I have also marked on this map above where I went wrong, losing the view of the sea with the earth down below. There are not that many paths, the difficult bit is describing where I parked and the first path I took from the car. If you get to the main path it is fine to find the arch. What is the terrain like? Rough but manageable with care. Once you get out of the car the paths are firm but with loose rocks so I recommend good quality walking shoes with proper gripped soles and ankle supports. The path is fine to walk on, but there is a bit of gentle scrambling down the path to get to the arch. Anyone in good physical shape should be able to get down to the arch but make sure you take care going up and down the steep bits, and also take care not to disturb rocks which might fall on someone below. I am afraid that there is no safe way down for people in wheel chairs or with restricted mobility. Check out this video on my YouTube channel Paxos Travel Guide which I took walking down that last bit of path. This is the bit from the last turning before the scramble down which I did not film. And this is what you get at the bottom of the path – The Tripitos Arch! I am a climber and former mountaineer so I found the path and scramble very enjoyable – if you are less experienced though please take care as the drops from the cliffs and the arch are significant. Can you really walk over the arch? Don’t be scared. Read my real world review of the Tripitos Arch later on in this post and you will find out what it is really like. All I need to say here is that it is bigger than you might at first think, and certainly bigger than it looks from a boat. So unless you have a serious fear of heights you are fine to walk over the arch to the other side where you get great views looking back to the coast and also the other way to Antipaxos. I will say it again though – please take care on the high bits as the drops are big and the consequences of a fall very serious. Can you climb down to the sea? I do not think that you can safely climb down to the sea and then get back up again. I managed to get some way down the rocks but did not continue down to the sea. I was on my own and did not want to take the risk. I am planning on returning though so will give this a go – in fact I will take a waterproof bag and swim around the arch – now that does sound exciting. Is there a phone signal there? No. This is how I got into problems finding it. I was relying on the phone signal on my iPhone to navigate there. I got so far and then lost my phone signal. I therefore recommend getting good directions. I will try to describe how to get there, although this is difficult as you need to get to the parking which is a tad vague to be honest. Is this really my favourite thing to do on Paxos? Yes, it was. I love exploring, travel and photography. I love landscapes and natural structures. And the fact that I was sat on the top of this magnificent arch all on my own was a real treat for me. So, yes, this was my favourite thing to do on Paxos. The boat trip to Antipaxos was a very close second. If you like this kind of thing you will love it – if not you will wonder what I am going on about!! Is there anything else near the arch? There is a disused windmill not far away – a 10-15 minute walk. Here it is. OK – that is all I need to know about the Tripitos Arch – but what is it really like? I should have called this post 10 reasons why you should visit the Tripitos Arch. But I didn’t. A great sunset location – I would imagine! This really was my favourite location to visit, and one that I would love to come back to at sunset. It is on the wrong side of the island for sunrise, but sunset there would be pretty stunning. I do not have any sunset photos of Paxos, as the time the sun sets impacts on social time with Mrs M.
As I was saying in another post, we were on a day trip around the island in our hire car. We had visited Gaios and Mongonissi, and decided to call in at the Tripitos Arch on the way back to Lakka. And that was where the fun started. I parked the car where I thought I needed to be, and set of walking. Nickie decided to stay at the “car park” and have a break, so it was just me and my camera gear. I set off walking, following Google Maps on my phone. And I have marked where I got to on the map – no arch anywhere to be seen. I walked around a bit, conscious that Nickie was sat on her own in the car. I quickly gave up and headed back to the car which I thankfully found without a problem. Nickie was sat there getting some sunshine. We went back to Hotel Bastas, and I took further advice from Sam, our Olympic Holidays rep.
Whilst we were sat at the pool Nickie found some advice on how to find the arch on Trip Adviser, which filled in the missing link, namely the path down to the arch that I missed earlier on. Armed with that gem of information and the advice of Sam I got back into the car and headed back to Ozias and beyond! I know I have said this before but I find driving in a foreign country very enjoyable and liberating. It is a great way to get to know a place. So I had a very pleasant 20 minute drive from the top of the island to virtually the bottom of the island. I stopped en route to get some water. There is a shop on the road from Lakka before you get to the village of Magazia. I bought two small bottles of very cold water and treated myself to an ice cream which I ate in seconds as it melted in front of my vey eyes in that sweltering afternoon heat. I have made the mistake too many times of not taking water with me – not today. The drive including stopping at the shop and eating the ice cream takes me 20 minutes. Yes Paxos is that small. Arriving at the car park. I drove on from where I parked for my first attempt. One problem I found is that there is no indication of where to park. This is not England – signs, restrictions, warnings and ticket machines. No this is Paxos. There is nothing. No indication of where you can park, or even should park. But then again there are no restrictions, or indeed other people. In the end I decide to turn round and park where I did before. And now lets get to that arch! It makes such a difference knowing where you need to go. I knew exactly where I needed to go, and found the right path straight away this time. I was walking with purpose and conviction, as though I had done this journey a thousand times. Not the headless chicken wandering up and down the wrong path looking for an arch! It was a longer walk than expected, possibly after the lies sat nav told me earlier. I find the critical path. This is where I went wrong before. X marks the spot on the map above. And I have even taken a video of this section of the path which you can find earlier on in this post. Oh ok then here is another link to that same video on my YouTube channel Paxos Travel Guide. I walk down the path and come across a level piece of path and wow what a view. This is it. I am looking down on the Tripitos Arch, the thing I have been looking forward to visiting most on Paxos. And I am not disappointed. This is the view I am looking at. Absolutely stunning. Really stunning. What are the top three things to do on Paxos? Well, when I started writing this the Tripitos Arch was the number three thing to do in Paxos. I have just checked back that page on Trip Advisor and the arch has been promoted to number 2. According to this page on Trip Advisor Vrika Beach is the number 1 thing to do on Paxos. I disagree. Firstly, Vrika Beach is not even on Paxos! No sorry Tripitos Arch is my number one thing to do on Paxos. This truly is a stunning view. I take shots on my iPhone on the way down, and am going to take photos on my Canon 6D on the way back. This is how I work on such a trip. iPhone photos and videos give me immediacy, and the photos taken with my Canon 6D give me the best possible quality. I shoot a couple of videos, basking in the glory of actually taking some water with me this time. And my Salomon walking boots are just the best for scrambling over rocks. Water everywhere and a drop to be had. Here is a video of me drinking water. Yes it is such a signficant event, me actually remembering to take a bottle of water, that I had to make a video. 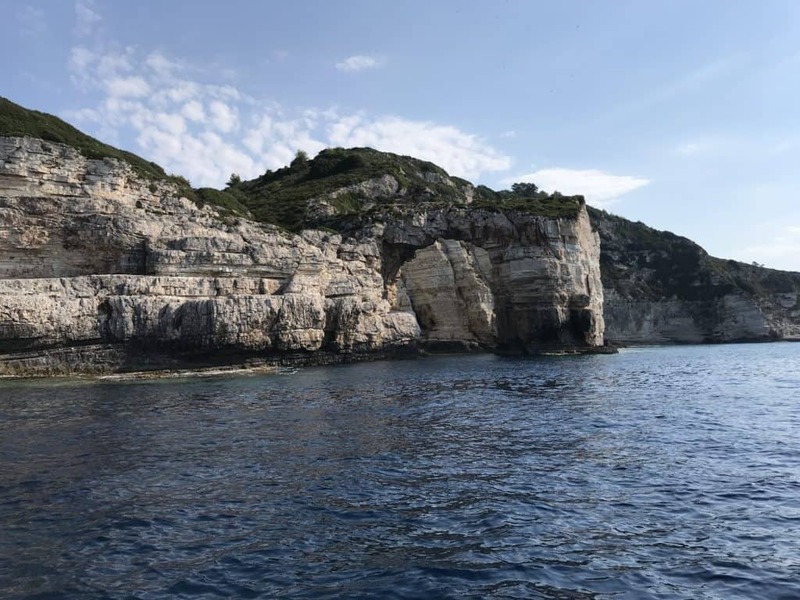 I think I mentioned this before – on our boat trip from Paxos to Antipaxos, which you can read about in this most excellent post titled Paxos Boat Hire – Do Your Own Trip From Paxos To Antipaxos we sailed past the Tripitos Arch. And I have to say it didn’t look as though you could walk over it from the boat. But when I actually walked down to it I realised how stupid I was. I walk over the arch – it is much bigger than I thought it would be so that is fine, and sit down and just take in the views. Once I have gone as far as I can on the arch I go north to the lower rocks where I get a great view of the arch with the sun illuminating the rock face. I would like to be able to go back there in the morning, well I would like to spend an entire day there as the light moves around the magnificent natural arch structure. Maybe another time. Yes I really could spend a whole day there, from before sunrise to sunset. Just me and my camera. And some food. And a lot of water. OK – sunrise and sunset and pop in a few times in the middle would be fine. When is the best time to photograph the Tripitos Arch? Find out in this video! I am a photographer. An architectural and travel photographer. So things that do not move are my kind of subjects. Things that do not move and scenes that have no people in them. I have happily photographed the arch, and taken lots of videos, so decide it is time to head back to the car. And then I think no – when will I be able to come back here? We are going home in a couple of hours. I decide to climb down the rocks and see what other views I can get of the arch. I am equipped for such scrambling, which I find myself often doing when I am trying to find a sunrise location, so this is normal business for me. I carry all my gear in a Peak Design Everyday Backpack, giving me both hands free at all times, apart from when I have my camera in my hand that is. Climbing down the rocks is great fun. I stop before I get all the way down to the sea – I am after all on my own and there is absolutely no signal down here. And I have not see a boat pass for a good while. I am looking down at the spectacular shades of blue in those crystal clear Ionian Sea waters. Here is a photo of the Tripitos Arch, taken with my Canon 6D and processed using Lightroom and Photoshop. When I have finished writing articles for this website the last job is my reward for completing all the hard work – I am going to process my favourite photos of Paxos. I have no idea how many photos this will be, but they will be placed into a single gallery. I have done this for my other travel photography website Photos of Santorini. And now I am happy that I have seen as much of the Tripitos Arch as I want to it is time to move on. Two Italians appear – I have not seen anyone at all for a couple of hours now, so that was a bit of a shock. I know they are Italian as I hear them speaking in Italian. They appear from a path to the north of the arch, and walk past the arch stopping quickly to take photos before moving on up the path and out of view. They must be in a hurry! Meanwhile lucky old me has all the time in the world to take in the last view of this magnificent arch before I climb up the path and head back to the car. Yes, there is a disused windmill. Now I am a photographer. I photograph buildings for a living. I cannot resist a disused windmill then can i? I head back towards the car and then turn left in stead of straight on and follow the path in roughly the right direction. Back the way I came for the Tripitos Arch and this way for the windmill – sorted! Now I am in the olive groves the temperature has just shot up noticeably. And I am now it of water. Still it is all good stuff and what I love doing so no problem. I head off and in 5 minutes I am there. I am really high up here, and can actually see the sea on both sides, which is rather confusing until I remind myself just how small the island is. This is what the windmill looks like. It is quite a long and hot walk but I am back at the car soon enough. And with that I am back at the car. 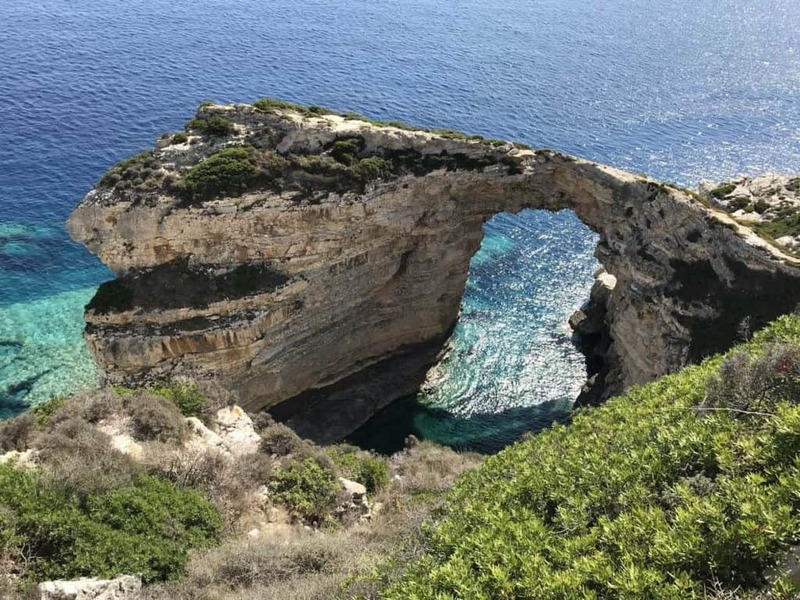 The Tripitos Arch was a stunning, spectacular natural landmark, and definitely the best thing that I have visited on Paxos. I recommend anyone who is fortunate enough to find themselves on the lovely Greek Island of Paxos visits the Tripitos Arch. I don’t want to sound like like a nanny here but I will say this one more time – if you do go down to the Tripitos Arch make sure that you are appropriately equipped and physically capable, and that you take care and enjoy the experience. I have been looking forward to this for a long time. Like over a year. 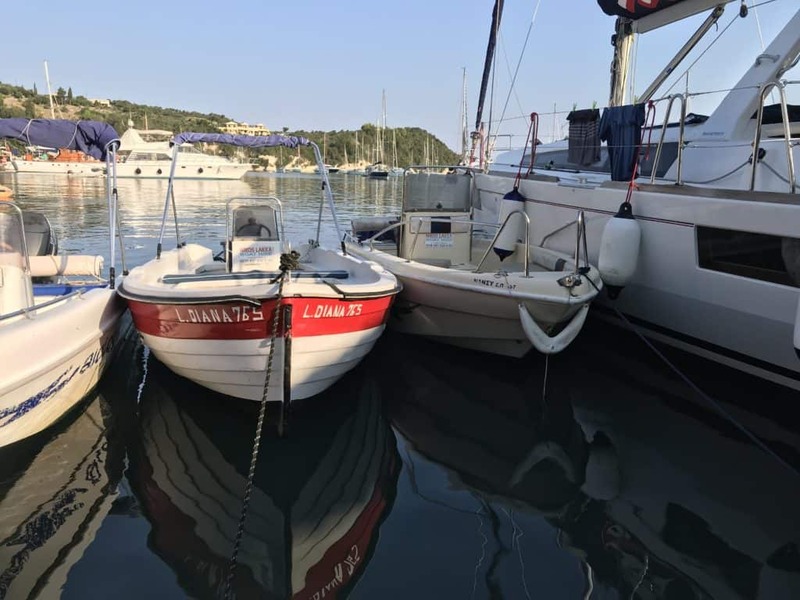 Paxos Boat Hire – Do Your Own Trip From Paxos To Antipaxos. This is what we did. And an absolute joy it was, just one of the best days. In this post I will tell you all about one of our best days out ever. 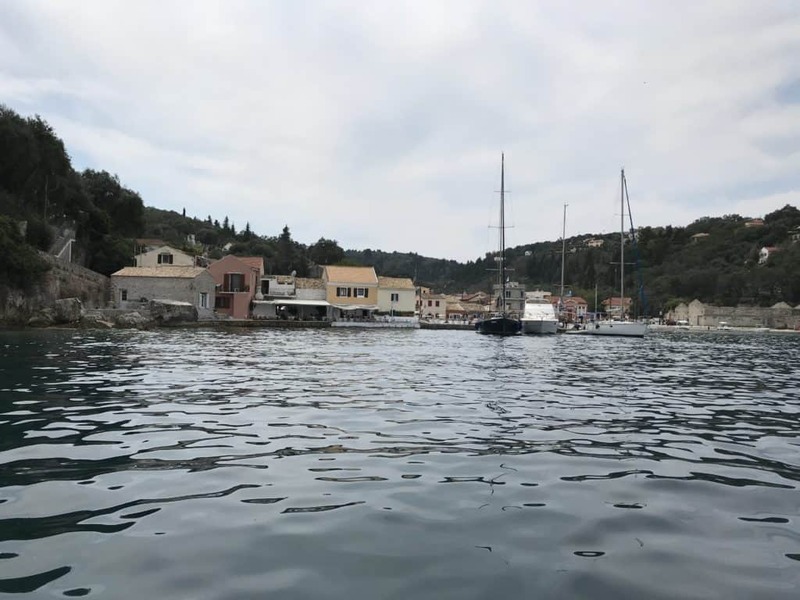 We rented a boat from Lakka, travelled down the west coast of Paxos, crossed over to Antipaxos then headed back up the east coast of the Greek Island of Paxos. We have been to Antipaxos before. We found Paxos by going on a day trip from Corfu to Parga (an the Greek mainland) and Paxos. This introduced us to Paxos. And on our first visit to Paxos we visited Antipaxos on another day trip. Now we are back on Paxos and want to go back to Antipaxos but under our own steam. Well I say steam diesel is more accurate. Finally the big day is here. To remind you, we rented a boat through our very knowledgeable and helpful Olympic Holidays rep Sam. It cost us €60, which was considerably cheaper than other prices we came across. The boat is moored in Lakka. Perfect. Today it is just the two of us and a little hire boat. First job is to get snacks. Very important when you are venturing out onto the high seas!! We buy supplies from the bakery on the way down to the front. We get a lovely sausage roll and a Greek cheese pastry thing. I also get a large cappuccino, which is not large but is still lovely all the same. And of course we have an amount of water to keep us hydrated on our epic day out. And where is our boat? Opposite Romantica no less! Yes, our boat is moored facing our favourite sundowner location. Leonardo meets us there and gets us sorted. He explains the basics of the boat and where everything is stowed and that it is us good to go. And yes, the boat is called Lady Diana! I reverse the boat skillfully out of the mooring area and before we know it we are travelling amongst all those lovely white boats moored in Lakka. It is so nice to be able to look at Lakka from the sea – it looks even nicer when viewed from the boat, with all that lovely flat water and the reflections of all the buildings. We get to the entrance to the bay in Lakka, and turn left. This takes us to down the west coast of the island. This is the bit with all the caves in it, which is all rather stunning I have to stay. We stop to have a look at some of the caves, and there is a very surreal moment when the birds are circling above us with their cries echoing around the rocks and the caves. I think what they are trying to say is – bugger off out of our house – whatever that is in Greek bird speak. Check out the video of this unusual experience on the Paxos Travel Guide YouTube Channel! We slow down a few times checking out these wonderful caves as we travel down the west coast of the island, but do not stop anywhere or get out for a swim – plenty of time for that later. And here is a video taken driving away from these wonderful cliff faces, again on the Paxos Travel Guide YouTube channel. As we head down the west coast of Paxos we pass the magnificent Tripitos Arch. I will write a separate post solely about this wonderful natural structure. We pass close by the arch and marvel at the wonderfully clear blue waters with the rocks on the seabed clearly visible even though they are metres below us. We get to the bottom of Paxos in about an hour, not going too fast as it is quite choppy in places. We then just go for it straight to Antipaxos, which we can see in front of us. The crossing is a bit bumpy in places but before we know we are in the waters of Antipaxos. We sail/ drive past the first beach on Antipaxos, Vrika Beach, and the next much smaller beach Mesovrika Beach. The next beach is called Voutoumi Beach, which has the Beach Bar and Restaurant Voutoumi just off the beach, and the restaurant called Bella Vista looking down on this wonderful beach. The water is stunningly aquamarine and clear. And there are some incredible boats moored there – yachts and things that are so big I am not sure what the right word is for them. Big boats? Ships? Yachts? Floating palaces? Whatever they are stunning vessels. Check out this low quality video. No idea but they are absolutely jaw dropping. And clearly they cost a lot of money. We headed back to the first beach, which is where we are going to stop for a drink and a bit of relaxing after that busy old morning! Relaxing on Antipaxos += beer and sunbathing. The question however is this– how do we get off the boat with our bags? The plan is to attach the boat to the fixings on the right hand side of the bay, just like we were told not to. I am not happy with the security of the fixings, and neither I am happy that we are doing what we were told not to, so I change my mind and undo all the work I have just done. My next plan is to go to the other side of the bay where the ferry drops people off and picks them up again later in the day. And now on the other side of the bay! I drive the boat over there, and this is where the problems begin. We can’t find anything to hold on to, and I end up jumping for the shore with the boat rope in my hand and missing the land, dropping in to the rocks right in front of the landing platform. Yes this really did happen. I dropped the rope as I crashed into the jetty wall, sliding down the face of it into the water. Next my flip-flops came off and start floating away. I manage to grab my flip-flops and get the rope for the boat. Not far away an Englishman is asking if we need any help. No thank you I reply as I am struggling to get back into the boat. Are you sure you don’t need any help?? My next reply is less polite, but no swearing thankfully. I get back onto the boat, gun the engine and go back to the other side of the bay. I get to the other side and gently drive the boat to a rock up stand with tires and hoops and the like on it. The latest plan is for Nickie to climb off the boat onto the rock sticking. All I need to do then is pass the bags to her and she can then walk to the beach while I take the boat out into the bay and drop anchor, with me swimming ashore to join her. I should probably state at this point that Nickie is crying while I struggle with the boat in the waters, which have got very choppy, would you believe. Anyway she manages to get off the boat and I pass the bags to her. I manage to get the boat where I want it, slow down, put the boat in neutral and then drop the anchor while the boat drifts gently forward. I do this in a highly skilled way. Very proficient and professional. All I need to do is wait for the anchor to bite once it has found purchase with something on the seabed. Nothing happened. The boat just continued drifting forwards into the swimming area. I know – I really shouldn’t be in there. Three times I try and then success – the anchors feels secure. I pull the boat back a bit and tie everything off. I am not sure that the anchor is secure, but the boat is not moving. I am just about to get off the boat when another couple, who are having less success than me I have to say, crash into the side of the boar. Well bump more like – crash is too dramatic. I push the other boat away (they are not English) and decide to jump in the sea and swim to shore. I keep looking back expecting to see the boat moving, but it looks to be fine. Not as cold as when she bought it mind! Still we have an excellent table at the restaurant, and the beer is very welcome. Crossed words are soon forgotten as we relive that happy moment. Is the boat still there? I have my beer, and Nickie goes to the beach. I am convinced that the anchor is not secure and need to go back and check that everything is ok. I clamber over the rocks, and swim back through the now even more choppy waters, and clamber onto the boat. The ladder is not the best, only three rungs, so you have to throw yourself forward off the ladder and grab onto anything that is there. First try I think I have broken my wrist, but after a few attempts and me manning up I manage to drag myself onto he boat. And guess what – the boat is just fine. The anchor holds firm and all the knots are secure. The boat has not moved at all in half an hour. So I tie more knots on the rope just in case. Well it makes e feel better. I leave the anchor well alone though, as this appears to be perfectly secure – if I fiddle with I will just be worrying that I have made it less secure. Which inevitably is what will happen. I swim back to the beach and spend 30 minutes lying on the beach expecting to look up to find the boat drifting away. Plot spoiler – it doesn’t. I am ready to get moving, I don’t need to worry about the boat when I am in it. I have had more comfortable also more relaxing times on a beach! Oh yes another thing. What do you do with the boat key? I ended up tying it using the waste cord on my shorts. 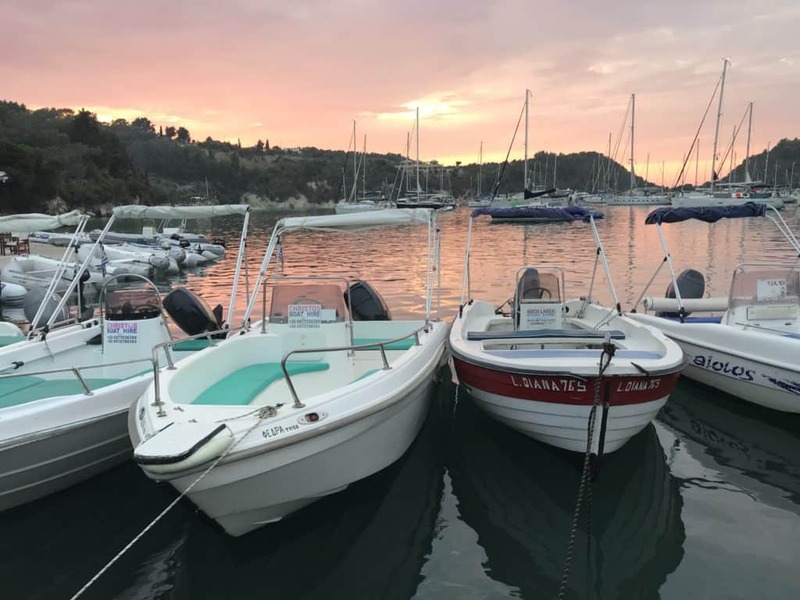 A top tip from me if you are planning on renting a boat and going from Paxos to Antipaxos – well this applies if you are hiring a boat to anywhere to be fair where all you will be wearing is shorts and a t-shirt. Buy a cheap waterproof container. A brightly coloured one that floats. And put the key in that. Time to leave Antipaxos and sail back to Paxos. I get back to the boat, and drive very slowly for the other jetty signaling Nickie where to go. I do a textbook arrival, grab onto the chain at the side, Nickie climbs on and off we go. It was completely incident free. Why did I not do this the first time??? At the bottom of Paxos there is a very small round island called Kaltsonisi. There is a lovely channel between the island and the mainland. It is a very pleasant pootle indeed, nice and slow. Apart from one idiot who has dropped anchor slap bang in the middle of the channel. I have to squeeze myself between them and the rocks as there are boats moored all along to the left. I make it though of course, and before we know it we are in Mongonissi. Very nice. Check out this video of Mongonissi from the boat. I find a nice spot to moor the boat, drop anchor, drift in serenely and Nickie jumps off the boat straight onto the beach, attaching the rope to the mooring point. All of a sudden we look like a slick boating double act! I tie off the ropes, get the keys and we go for something to eat. I ask Nickie if she has seen my t-shirt. I have not seen it for a while. To cut a long story short it is at Taverna Spiros – the bar we went to on Antipaxos. Now I have a thing about sitting in a restaurant without a t-shirt on – I have standards you know – we both do. As we walk up to the lovely Mongonissi Beach Bar we both apologise to the waitress for my shoddy attire – I have my Barbados towel over my shoulders and that is all. She is fine with that, so we sit down and order drinks and peruse the menu. What to do about the t-shirt? I have no phone signal at all – yep completely cut-off. Remember this if you are using your phone as your sole emergency back up when on Paxos – you can have a full signal then find yourself all of a sudden with nothing. I talk about this in the post Paxos Car Rental – Everything You Need To Know. It’s only a t-shirt though? It’s a t-shirt which we bought in Barbados. It is one of my favourite t-shirts, so this is serious! 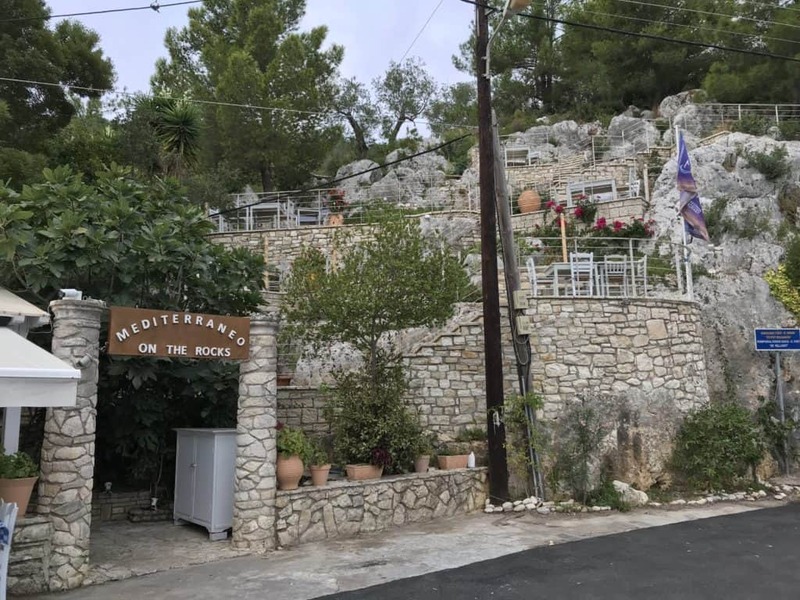 Nickie texts Babis at Hotel Bastas to see if he can help, and then phones Taverna Spiros. The bloke who answers the phone does not understand, he just wants to know when we want a table and for how many people. Now my wife is very resourceful, and asks a local chap standing next to her if he could explain to the chap on the other end of the phone our predicament. It sounds ever so silly now but at the time I needed my t-shirt back! He has no joy either so we sit down and debate what to do. Which for me is accept that the t-shirt is lost forever. And here is the spooky thing! The chap from the restaurant walks over and says – are you the people from Lakka? How he know I have no idea – we never told him that. He tells us that my t-shirt will be at their sister restaurant in Gaios later on that afternoon. How did that all happen? And how did he know we were from Lakka? We thank him profusely, and tell him that we are in Gaios tomorrow so will collect it then. I know it’s only a t-shirt, but it was a special t-shirt from Barbados as I said. Lunch is cheeseburgers and salad, which was very nice. With a large beer which we share. Back at the boat now, and on the way out of Mongonissi Nickie takes a turn at driving the boat. Do you drive a boat? I have had this thought before. I have to say that she does a splendid job, leaving me to take some videos with my iPhone. No the Canon 6D has still not made it out of my bag. Oh yes the bags. When we moored up at Mongonissi all the water at the back of the boat went to the front, getting everything wet – even my beloved Peak Design Everyday Backpack with all my camera gear in (my camera gear was fine though). Just something to be aware of. We sail through the channel at Gaios, which is lovely to see from a boat – I am so proficient at driving the boat I can shoot videos at the same time – here is one of them! The channel is the body of water between mainland Paxos and another small island called Panagia. Having been to Gaios a few times it is great to see the frontage from a boat. We follow the channel around the island, ending up at the New Port I Gaios where the ferries drop off and pickup tourists arriving to and departing from Paxos. We head northwards and have a swim stop in an unnamed bay. That was a very welcome dip in the lovely water of the Ionian Sea. 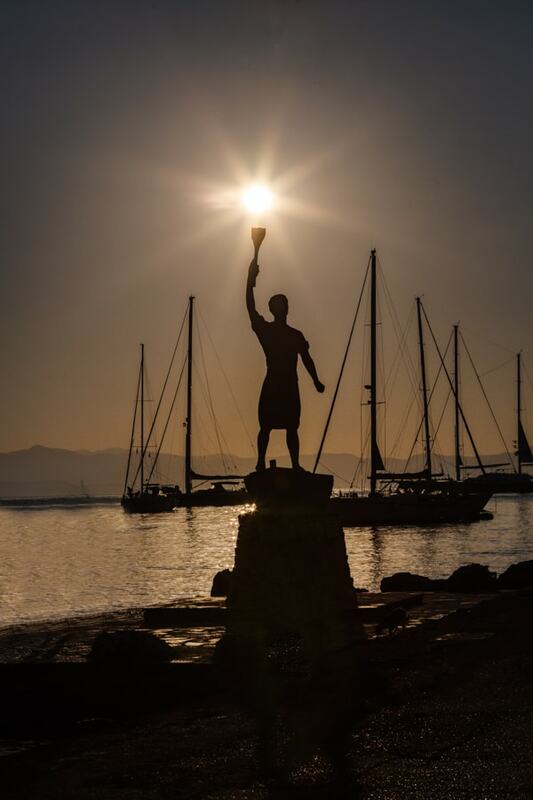 We look at various beaches on the way back – this is a video of Glyfada Beach. Loggos is one of my sunrise photography locations, and I love it. Check out the views of Loggos from the boat. And here is a 360 video of Loggos taken from the boat. We arrive back at the opening of the harbor in Lakka at 5pm. The boat is not due back until 6pm, so wee have time to explore Lakka by boat. And this is my one chance to take some photos and videos of Lakka from the water. Nickie skillfully and slowly drives us around the harbour and I take lots of photos on my Canon 6D and videos on my iPhone. We are back at the boat hire place at 5.30pm. When I say the boat hire place I mean the metal hoop opposite Romantica. Time for the expert to put the boat to bed. The expert is of course not me – it is the chap from Nicos. The gap for us to get the boat is tiny, but the chap from Nicos is very skilled at making room (unforgiveable I know but I have forgotten his name). The chap in the very nice boat next to the gap where our little rental boat is going is not impressed, he really was not happy having that little boat next to his shiny expensive thing! But that doesn’t change anything. We get off the boat and pay for the fuel that we have used – $45. To be honest we have no idea how that calculation was made! And then head back to the hotel to cool down. That was the title of a song some years ago. Clearly the message I have long forgotten. I learnt an important lesson today – not wearing sunscreen on a day like this is really not a good idea.!! Well I did put some factor 15 on my face and head first thing in the morning which I think saved me, but I didn’t put any on my torso, which was bare for most of the day. Unbelievably I am not burnt. That is a good thing but also a worry! Time for a quick shower and then back down to Romantica for cocktails and to be reunited with our boat. We see Babis and Mrs Babis at the front of the hotel having them just gone through changeover day – they look like it has been a long day. Good news – the hire car is confirmed for 10am – no later! We reserve a table at Pounentes for 8.30 on the way through – it was really good there the first time, and as time is running out for us we do not want to risk another dodgy meal. I confused the waiter at Romantica by choosing a blood Mary, stealing his moment of remembering what we both drink for the first time! We sit down on the front and watch the sunset with Lady Diana 765 sat right in front of us. Dinner is excellent. To get over the not managing to eat everything we order tzatziki with bread to share as a starter. For the mains Nickie goes for the steak with pepper and Metaxa sauce and roast potatoes, and I go for pasta with mushrooms, oil and chili. Not the kind of meal I would normally go for – the chap who welcomed us suggested this instead of the spag bowl I ordered originally – as he pointed out I can have that at home. But I want it here! I go with his choice – on his head be it…..
A carafe of wine arrives and we sit back and drink and chat until the starters appear, which are lovely. We get a nice break before the mains come. Am I going to like my pasta dish? The mains are brought to our table, and I tentatively start eating, not saying anything, which Nickie knows full well means I am not loving it. I persist, and then we have a swap of plates. I have some steak which is lovely, and polish off the roast potatoes left (at Nickie’s instruction I have to add). Then we swap plates back and, I have to be completely honest, the dish is growing on me. Outer waiter friend comes over and asks me nervously if I am enjoying it. Deadpan I say it is awful. His face is a picture. I take pity on him and quickly smile. I can’t do that to this lovely chap. He gets it – I am impressed – our waiter at a Greek/ Italian restaurant getting English sarcasm! We finish our meals and head off back to get some sleep after a very long but most enjoyable day with my best mate, MRs M.
My alarm goes off at 5.40am. Why do I do this? I need sleep. I am photographing the Paxos Island sunrise. This is what it is like. This is the reality of doing this crazy stuff. So, I will now stop complaining and tell you all about photographing the sunrise on Paxos and then also having a day’s holiday! OK I am up now. I am up. I have only myself to blame. No one has asked me to do this have they? No this is all down to me and I just need to get on with it. I get myself ready, kiss the sleeping Nickie goodbye then creep out quietly with my camera bag, snacks, shoes and socks. I put my shoes and socks on outside the hotel. I have cleverly taken a t-shirt off the chair on the balcony, which I have only now realised is a tad soggy. I can’t get back into the room, as I don’t have a key, so all I can do is crack on with a damp t-shirt! I hope I have remembered everything? If not I am completely knackered as I can hardly wake Nickie up at 6am one can I? And I then remember that I have absolutely no money with me, so no chance of buying a drink when I get back to Lakka from my destination. So that’s the planning I wrote about yesterday then! Thankfully I know where I am going. I still can’t stop myself going over to the concrete wall forming part of the harbour – I really want a picture of all those boats in the dark with the lights on. My Canon 6D excels at this kind of thing, extracting out every ounce of colour, detail and content from a virtually dark scene. My Canon 6D effortlessly focusses on the boats in the dark sky – quite miraculous really. For all those people who criticize Canon for lack of innovation etc we all need to remember that cameras like the Canon 6D are workhorses – plain and simple. My Canon 6D has performed faultlessly ever since I bought it. Well apart from that time I dropped it on the hard-paved floor in the National Trust office at Corfe Castle that is. I am using my mini tripod, the Manfrotto Pixi – seriously that is all I use for travel photography these days. I can get it to work with my Canon 6D and Canon 24-105mm lens – you just need to think about it. And the shots I get are perfectly sharp. But you have to lie down/ sit down/ get down to the level of the camera to view the composition – this is the one downside. But I manage. 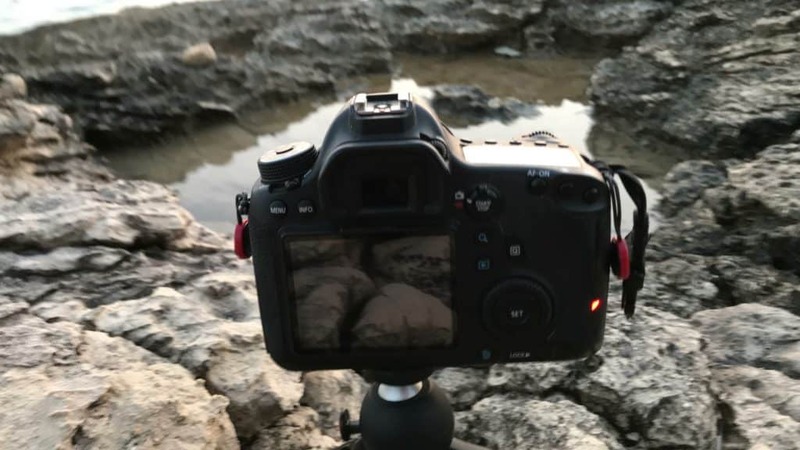 This morning I am placing the tripod on rocks by the water, composing using live view, focussing one third in using back button focus and then setting the 10 second self-timer off. Here is a photo of my beloved bobbing boats before sunrise. I get the shots I want here, and move around the harbour. I find another location and start taking photos. Then as I am dragging myself up off my rock with my camera in my hand I catch a rock, and watch my lens hood falls off, bounces off a rock and the next thing there is a gentle plop as my camera lens hood lands in the water. It’s still dark but I will show you this later! Bugger. I don’t have a spare. I can see the lens hood down there in a convenient circular hole in the rock but cannot reach it. I decide to come back later and see if I can fish it out. Meanwhile there is a sun still rising over to the east! I get back to the path and walk quickly round to the spot where I am going to take my photos of the sun rising over the Greek mainland 24kms away. But I don’t like the location, and sea level is a bit higher that when I was last here. I take a couple of shots from an alternative viewpoint and decide to go to the beach I was at the other day, which is just around the corner. I get there with about 10 minutes to spare. Sunrise is 6.53am. Plus there is the bit of mainland for it to get over. I search around for a composition I like, and settle on this, with the bottom half of the frame filled with some water in a rock pool, with the horizon the upper third line, and the sun going to appear somewhere dead central. This is according to my App TPE (see yesterday’s post for more info). I sit there with my camera ready and take a couple of videos and behind the scenes stuff – I get so much material from a sunrise shoot. 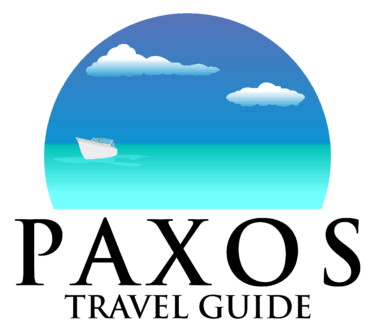 This is a 45 second video on my YouTube Channel Paxos Travel Guide. I see the sky go brighter, telling me the sun is about to appear. I am going to video the sunrise with my iPhone and take stills with my Canon 6d. All I need to do is press the shutter, wait the 10 seconds and that is an image done. I repeat this for the duration of the sunrise. And here come the naked swimmers!!!! Three minutes in I hear a voice say kaliméra, and a bloke who I can just see out of the corner of my eye stripping off his clothes and getting into the sea. I am filming so can’t turn around, thankfully. Another bloke appears and does the same. I can see them over to my right swimming. I stop the video at 4 minutes as the sun is up. I decide to head back to the other location – I really need to pick my spots more carefully!! I take quite a few photos on the way back, sweating profusely as I go but enjoying my walking shoes which make me move like a mountain goat over all those rocks. Well sort of. There are some interesting things I observe – I do notice that I see more on times like this when I have got the shot I was after, and can relax, walk back slowly and just look around me. Sunrise might be up but there is still that lovely directional morning light to play with. And a quick note of digression here – I am not one of those who only goes out at the best times of day i.e. around sunrise and sunset to take photos – I am a firm believer that there are great shots to be had at any time of day, even noon with that so-called hideous overhead light. You just have to look around and find them. Another aside now that my head has gone back into photographer mode. I am always trying to find different views on things, I am not all about getting the headline shots that everyone seems to want to get. If I want to look at them I can just stay in bed find them on the internet. Back at the other spot, and I take a couple of shots of the scene I had planned to shoot and then move on, rather than taking the path back to Lakka I follow the coastline, which involves a bit of scrambling over rocks, and get to the end of the island and the entry into the bay of Lakka. Is it a harbour? Or a bay? I’m not sure. No matter. Here I am greeted by all those lovely boats moored up, and here are lovely shimmering reflections off the water. I take a few shots, and even a video with my Canon 6D – unheard for me I know. I also took some gear shots – these are really useful, and I am using these in my strategy to get some commercial partnership deals going. I take photos of my Peak Design Everyday Backpack and Manfrotto Pixi Tripod with my Canon 6D sat on it using the most excellent portrait mode on my iPhone 7 Plus. Back at the jetty – where is that lens cap? I get back to the concrete jetty – it is time to retrieve that lens cap. Here it is. I thought it was in a hole and wouldn’t go far and thankfully I was right. It will be a lot easier to rescue this vital piece of plastic in daylight. I put all my stuff in my bag and put it on a rock. I lie my t-shirt down on the rock then shove my arm down the hole. Too deep – can’t reach it. Right next to me is a stick with a very helpful bobble on the end – I manage to efficiently hook my lens hood out of the hole in no time. I attach the lens hood to the outside of my bag using one of the many utility straps that you get with the Peak Design Everyday Backpack, keeping that salty water away from the inside of my bag. I take a few more photos on the way back and decide that this is where I am going to come back to in the morning – there are so many potential shots to capture at this time in the morning. And we can have a nice breakfast by the water too. I had almost forgotten how much I love going out on a holiday and doing these sunrise shoots – they really are a favourite photographic thing for me to do. And they get me off my arse and moving! I got back to the hotel about 9, desperate for a drink as I forgot my wallet. Still not done with my work on holiday! Breakfast is toast and honey with a coffee in the room – the bread from last night’s meal that we did not eat. Once we are sorted I write my journal for the day and we head off up to the pool. Luncheon is a very pleasant chef’s salad and a mushroom omelette which we share. The omelette is somewhat spoiled by the cap falling off the pepper as Nickie was trying to sprinkle pepper onto the plate – situation recovered, and we have a nice lunch. Lunch with a beer. Of course. We managed to source a boat from the Olympic Holidays rep Sam, which we received confirmation of later on that afternoon for the bargain price of €60 plus fuel cost. And where was my wallet? That is when I discover that I had my wallet in my camera bag all along, so I could have got that much needed drink in Lakka. And with that it is back to the room for drinks and showers and dinner. Cocktails at Fanis this evening – they have got the mint in again. Nice Mojito but I think Romantica is our favourite, especially with that upstairs bar. After our cocktail (without accompanying snacks I am disappointed to say) we walk back to the square and choose La Piazza to eat at. The carafe of wine is not good, so we ask if we can swap it for a bottle of red, which is fine all round so no problem. We share a starter, which ok I have forgotten,. I have chicken souvlaki and Nickie goes for prawn saganaki. Another case of prawns in shells served in a sauce. With nowhere to put the debris and no finger bowl. I’m sorry but you shouldn’t have to ask for these things. The food is ok, and we pay and go back to the hotel – a good two-minute walk. I am shattered so am asleep in no time after a quick Metaxa. This is the last day of rest for a while before we embark on our hectic schedule for the next three days. I set my alarm for 5.40am and get up half an hour later. I wanted the lights on the boats in the darkness but am too late this morning – it is considerably brighter than it was at this time yesterday morning. I try a couple of shots back where the lens cap incident took place yesterday, and potter around the harbour not sure where to go next. It is not a great morning for taking photos to be honest, and then the sun lights up the clouds which reflect off the water and give a me a few things to photograph. I have done about three laps of the harbour by now, with nothing really taking my fancy, and the sun is going to up soon. I decide to go to the opposite side of the bay to Lakka Beach and the beach bar which I believe belongs to the Amfitriti Hotel. Now that was a good call. Complete silence. I take some photos on both my Canon 6D and my iPhone, and then decide I am going to shoot some videos of the lapping waves. I set up my Canon 6D on the little Manfrotto Pixi tripod and get my composition framed up – I want a good 2 minutes of the waves lapping on the beach from low level. That is when the leaf blower fires up at the beach bar. I decide that I might as well just lie down on the rocks and wait, which his exactly what I do. I am by now too tired to get up, so I just lie there in the position to start my camera recording, which granted is not a natural position. Thinking about it I must look rather odd, but thankfully there are no passers-by. Then a chap walks past and cheerily says morning to me – how can he tell from this angle that I am English anyway? I set up my iPhone using a variety of rocks – who needs a tripod eh? And I do a 6-minute video if the waves lapping on the shore, which I am have put on my Paxos Travel Guide YouTube channel – let’s see what watch time that gets. I took photos while letting this video run and did a couple of short videos with the Canon 6D before heading back to the hotel about 8.20. I took a few shots on the way back, that morning sun still giving some great directional light. And then I come across the creperie next to Akis – check out the lighting here reflecting off those bright shiny tables. Very cool. And that is me done. I manage to get a butter croissant and a chocolate croissant which I share with Nickie back at the hotel. We have a busy three days ahead of us, so it is time to do nothing…… Nothing by the pool in that lovely sunshine. Nothing but listening to the cricket and thinking to be fair, which is where I came up with the plan going forward for the rest of 2019 and hopefully beyond. Over half way through the holiday, now and its looking like another tired day. Apart from one thing – my sunrise photos. 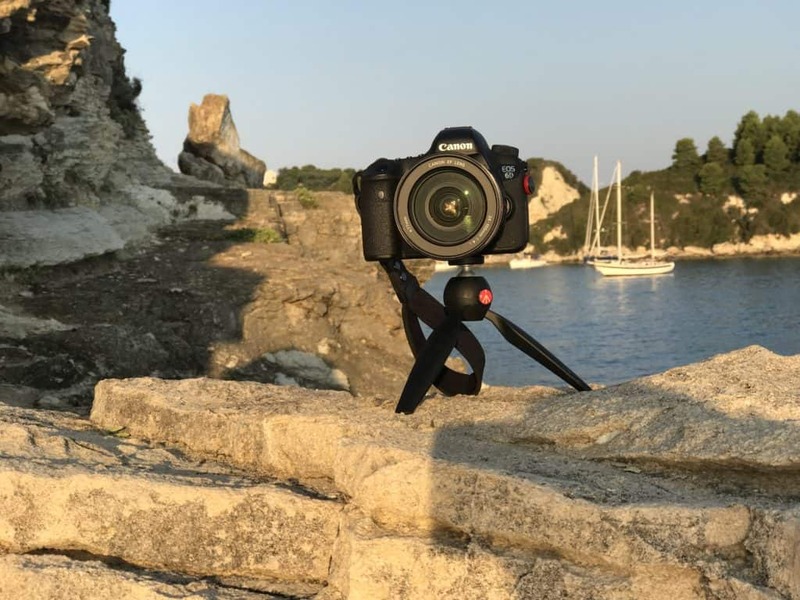 Do want to know how to get sunrise photos of Paxos Greece? Today I will tell you how I plan taking sunrise photos. Planning is essential to ensure that you know where you are going, how you get there, where the sun will and what else will make up the composition. Planning is the key to how to get sunrise photos anywhere to be honest, and planning is what I do well! And you never know in the next post I might actually publish one of those lovely sunrise photos. Before that, another day on the wonderful Greek Island of Paxos is to be enjoyed. My scouting trip I will come back to as I get to that part of the day. Sunshine is restored. It is another lovely morning on the balcony of room number 26 at Hotel Bastas. It is nice and quiet this morning. There are no dogs barking. There are no neighbours in adjacent rooms chugging away on gaspers. I am awake early for some reason. Mrs M is sleeping soundly. Basically all is good in the world of holidaying on Paxos. What is the plan for today then? Are we going to have a busy day today? I don’t think so to be honest. Today at the moment looks like being another day of living life like sloths. and before you know it is time to go back to the room for drinks! By 8.30ish we are both up and having our customary morning cups of tea. We are still drinking that that funny stuff from Yorkshire Tea, using our travel cups. The idea was to use our travel cups to take a coffee up to the pool, but they are doubling up now as essential morning cuppa vessels as well. We don’t need any more cups! We were going to buy some cups for tea from a local shop, but we agreed that as we already have enough cups at home to start a small crockery shop that this would not be a good idea. And we would have to try and get the crockery home in one piece. No that is a hassle I can do without. It took five days to make the quantum leap from using the tiny cups in the room to our large travel cups. Tea over, Nickie makes a coffee and leaves me to sit and type at the table on the balcony in the shade. It is a good bit cooler this morning which is a bit of a relief. Not that we are complaining at it being hot on the Greek Island of Paxos in August – of course it is! I have a productive hour writing on my iPad and drag myself up to the pool where we eat the cereal bars we bought from the bakery last night – very nice and will see us nicely though to brunch by the pool. I forgot to say yesterday – I managed to complete The Russia House – a marvellous story by John Le Carrie with a fascinating prologue. A fascinating if demanding read. It was a bit complicated to be honest, and possibly more challenging than was advisable for me to tackle in Paxos. Yes it is time for something lighter to read. Something which is nothing to do with photography, websites or business. I plump for a book called Bricking It by Nick Spalding, a nice light humorous novel. I downloaded this at the pool using the miracle that is the Kindle and the iPhone as internet gateway device – using the personal hotspot. This might sound like a strange thing to say but I am till in awe of the technology that allows me to order a book though my Kindle which instantly downloads using the signal on my phone – all whilst being sat by the pool on the Greek Island of Paxos. It’s great when technology just works like this. And not that long ago we would not have even thought of being able to do this! It is time to breakout of the Hotel Bastas complex! I have decided today to do a bit of exploring, and am going to scout my first sunrise location for tomorrow morning. After all I bought my Canon 6D and a couple of lenses mainly get some sunrise photos of Paxos. More on that in the next post. After a lunchtime libation of a Mythos each it is back to the sun loungers for an hour before we share a Greek pizza no less and a tuna salad at the pool bar – another excellent lunch courtesy of Hotel Bastas. 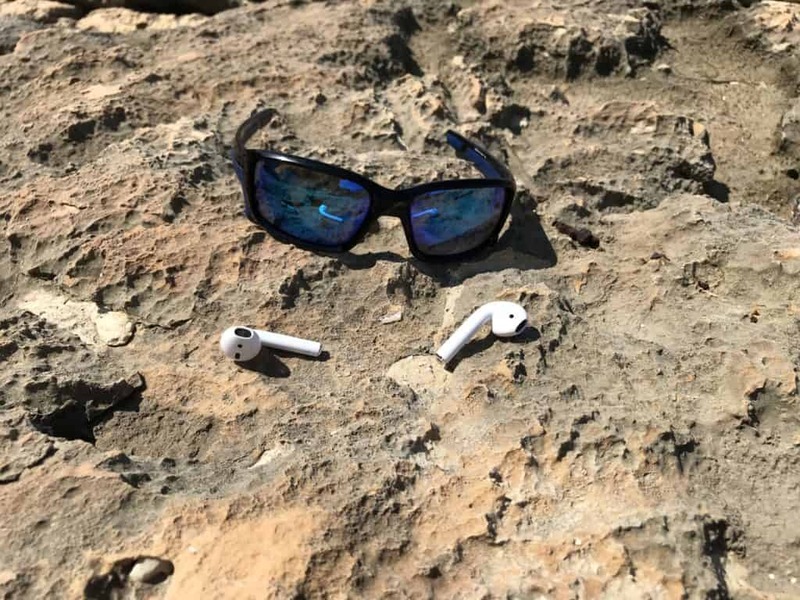 After lunch I head off armed with my iPhone, Apple Airpods and my Oakley sunglasses. There is a gate at the back of the pool bar kitchen which takes you straight to the hills to the side of the bay of Lakka. I take that path, and then realise that this will be no use to me in the dark of the morning as it will be locked. Oh well I will work this out on the way back. Off I go on the high path, and am soon in familiar ground having put the connecting paths together. I follow a good a path around the headland and end up back at Arcoudarki Beach – the beach I was at the other day. My first sunrise location is sorted, and I have found a better path there navigable in the dark. At my destination I use one of the excellent tools on my iPhone, The Photographers Ephemeris. I use this to ascertain exactly where the sun will rise. Using this tool I have the exact location of the shoot sorted. Another thing this excellent tool tells me is that the sun will rise at 6.53am tomorrow. This is the planning I was talking about. And I know how long it took me to get to my preferred location – I reckon I will be able to get these in the dark in 15 minutes, so need to remember to pack my bag and get my walking shoes out for the morning. I will set the alarm for 5.45, with the intention of being on my way at erm 5.50am. Planning determines the time I have to wake up – very important. I want to be up in good time but not too early! That will leave me time to get prepped and watch a new day dawn in Paxos – and I cant wait! I get a lot out of sunrises, with shots of my minimalist camera set up, videos of the sun rising and also videos of me taking the photos themselves. There are lots of great views on the way back to, not sure if they will work though due to their location. I am going to come back a different way, taking in the beach to that I visited the other day – the one with absolutely nothing there. I will out talking photos for an hour tops, and will get a lot of material out of this hour. And as we are on holiday I can catch up on any sleep on a sun lounger! I regret again not taking any water with me, and further regret going out in the stifling heat straight after lunch and a beer – not great planning! I am back within the hour though and cool down in the pool before having a recuperating bottle of water before having an even nicer cooling beer. Don’t worry – I don’t drink this often when I am at home! When in Rome as they say. Back to the usual position, reading on the sun loungers in the corner by the elevated pool of Hotel Bastas. I have said this before – we are creatures of habit, and have our preferred spot which is as quiet as we can get. We of course have no influence over who sits next to us – it does baffle us how sometimes people insist on sitting virtually on top of us when there is loads of room elsewhere. The pool has been lovely and quiet during the day, but it fills up so we head back to the room to get ready for another assault on Lakka. OK a couple of hours. We have to get supplies. It is time for a big shop! This evening we are low on water, milk, and more importantly wine and beer! I hate carrying water back to the room in the scorching afternoon heat! And the weather today has been Scorchio as they used to say on the Fast Show. Where to eat tonight is the eternal question we are now pondering over a nice G&T back at our room at Hotel Bastas. Decision not made we slowly down to Romantica in the baking evening heat for a nice refreshing Mojito each, and get treated to the balcony views looking down on the boats and sky disappearing over the horizon. We walk back to the square, and choose the restaurant called Taverna Pounentes, which is next door to Taverna Nionios that we ate at the other evening. Nickie spotted some staff from Neilson eating there, which must be a good sign. They wouldn’t be there if it was rubbish! We gave it a go, and are very charmingly greeted by the chap who appeared to be running the restaurant. We had a nice table, instant service of drinks along with plenty of time to peruse the menu. Very good early signs indeed. Starters – we pushed the boat out and had a starter each. I know, this doesn’t happen often and there might be a price to pay later for this early meal gluttonous decision! Nickie had a hot cheese dip, whilst I went for smoked cheese saganaki. Different but very cheesy. I have to sat that it was not my favourite saganaki – not the restaurants fault – this is how they do it and I have had it lots of times cooked another way that I prefer. No this is down to meal choice, and my taste. The cheese thing was good as well – so good that we bought some back and plonked it in the fridge. Main courses were also really nice. I know – how completely bizarre, but also utterly fantastic is that. And even better they were crunchy on the outside and soft on the inside – just how I like them at home….. I will say it again – I am sat in an Italian restaurant on the Greek Island of Paxos in August in the baking heat eating steak with ROAST POTATOES! Sensibly I ordered a bottle of still water, having spent another day not drinking enough water, which I know is stupid but I never seem to learn. And to accompany all that lovely grub we share a large carafe of red wine. A very satisfying meal with excellent service – just the job. A very enjoyable evening, and another restaurant that we will definitely return. Remember in another post I said that there were plenty of places to eat and drink in Lakka. That is in part as all the really good places I always want to go back to. Off to bed without any Metaxa tonight – it has been a long day, and I need me sleep! Oh yes – one last thing – I have to pack my camera bag for the morning. This consists of getting the Tupperware box of the stuff that goes in my checked luggage and putting it in the bottom of my bag, putting my camera on the top of my bag, and that is gear done. And at this point I remember that I have not actually taken a photo with my Canon 6D yet – day 8 and not a shot. I have been happy with my iPhone to be honest. I have actually bought my Salomon walking shoes this time – no flip flops or red pumps for me – no I am properly geared up for clambering over rocks and stuff. And my snacks – tomorrow they will be a can of actual, full fat coke and a pack of original Oreos. But this is what I have to put up with when I am venturing out to photograph the sunrise in Paxos. My Paxos Photos – what am I going to do with them? I am going to publish my Paxos Photos in a separate photo gallery of my – this will be the last job of creating content for my website, and I am saving the best till the very end. Photo editing – I love it. I will be publishing 50-100 fully edited photos taken and processed all by myself. Day 6 is on us before we know it. Nearly half way through our holiday. What are holidays in Lakka Paxos really like? Well in todays post I will describe days 6 and 7 of your holiday in Lakka Paxos. And these are two days dedicated to one thing – relaxing. I originally titled this post “the art of relaxing” – this is how we relax on holiday. 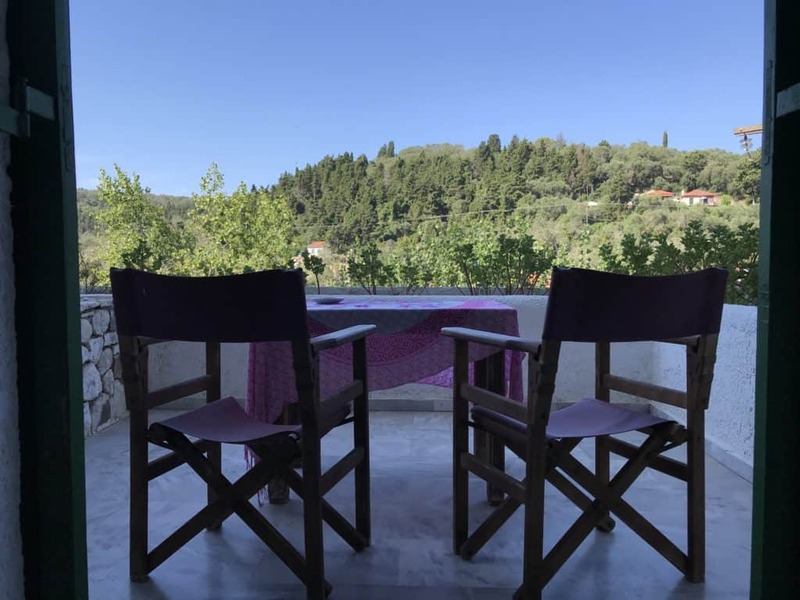 But I changed the title as I want visitors to my website to be able to find out what it is really like holidaying on Paxos – not from a travel guide but from people who have actually been there – people like us. We are quiet people and have a lovely quiet day by the pool. Cards exchanged, tea drunk and off to lax by the pool. That was the plan. To work on the art of relaxing. We did not have breakfast – some mornings on holiday we skip breakfast and have an early(ish) lunch. So no breakfast – no it was straight up to the pool with our travel coffee mugs. We got there nice and early and adopted our usual position in the corner. We are definitely creatures of habit, and always go for the same corner of the pool. If you get one of the corners you get more space and are less close to other people. Now this might sound a bit anti-social but as I said we are quiet people and we just want to be left alone to relax. A question of personal space! Corner secured, the next job is the slight rearranging of the furniture to maximise our space whilst subtly moving other people further away. Or is it just us? Some people don’t seem bothered by being shoe-horned next to strangers – no not us. And before we know it time for lunch! Blimey – such a busy morning. And now it is time to walk the length of the pool for lunch. And time for a nice cold one from the bar. We are not that hungry so we share a cheeseburger and chips, which was very very nice indeed. Food and drink done it is time to get back to the hard graft of relaxing. The afternoon by the pool was lovely and quiet. We stayed at the pool till quite late, and celebrated our anniversary with a lovely bottle of Lanson. Milestones like this should be celebrated – we face lots of challenges in our life together which face head on and jointly. We walked down to the waterside in Lakka, and reserved a table at Arriva, a lovely restaurant right by the water. This is one of those things that I love about Lakka. It is so small you just walk down to the front and browse the restaurants. 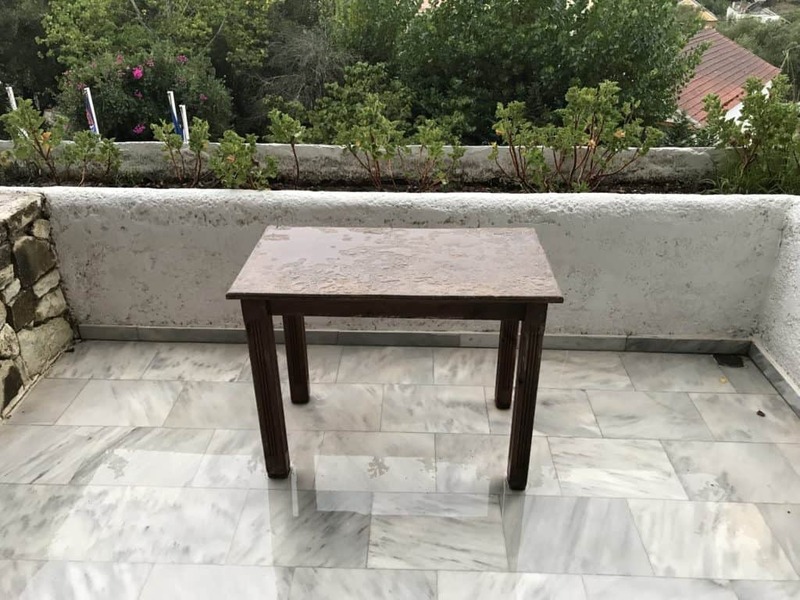 We rarely have trouble getting a table – possibly as the Italians tend to eat later than us and with them being in the majority we are fine with our preferred dining time. Having booked a lovely table by the water we headed back to Harbour Lights for an anniversary cocktail. After our cocktails we were sat down at 8pm (as usual). We had a lovely table right next to the water with lovely views across the harbor of Lakka as the sun faded away leaving all those lovely bobbing boats and the activities of a small harbor. A lovely carafe of red wine was brought o our table, which we drank slowly while we perused the menu. We shared a lovely starter of giant beans accompanied by fresh bread which was excellent. For our mains I decided to have stifado (for a change), with Nickie choosing the ravioli. All the food was lovely, the service was great, attentive and not rushed. A lovely way to finish our lovely wedding anniversary day on the island of Paxos. Day 7 – Thursday – its raining!! Halfway through the holiday and guess what – its raining in Paoxs? We were woken up by thunderstorms this morning. Yes thunderstorms in Paxos. Not just rain. And this is the balcony. I decide to do the decent thing and get rid of the water on the table so we can use it. I slowly and carefully move the table to the planters on the front of the balcony to tip the water gently into the planter. I get this disastrously wrong and pour all the water all over my legs. Not good. I hate having damp feet – thankfully even in rubbish weather like this it is quite warm and I dry out quickly enough. It is time for a cuppa and to watch the storms – good old fashioned thunder and lightning with bouts of light/ heavy rain. I have never seen such weather certainly not in Paxos – here if there is a cloud in the sky this is considered a disappointment! Check out the video “Rain in Paxos Greece” of this from my YouTube channel! The weather forecast is showing the storm will continue until 11am/ 12pm/ 4pm depending on which weather app we try. I tend to try all the weather apps and go with the one that gives me the news I want to see! I know – my choice of weather app will not influence the actual weather but it makes me feel better. And I really cannot accept rain till 4pm! Breakfast is the stuff we bought from the bakery last night on our way back after our lovely meal – biscuits with cream and a thing that was a rustic version of a cherry bakewell. All rather nice with a coffee. We were planning on eating these snacks last night but couldn’t manage all of them so they were welcome breakfast snacks. What to do when it is raining on Paxos? Well there is no point rushing to the pool, even though I am sure that this weather will clear up in no time. It stopped raining at 11am so we ventured out into a rather soggy Lakka full of people milling about all looking rather confused. Nickie went shopping. I went for a beer. And here it is! Well it was a slow day so why not! We reunited at the hotel and made our way up to the pool for another busy day of reading, eating and dozing. 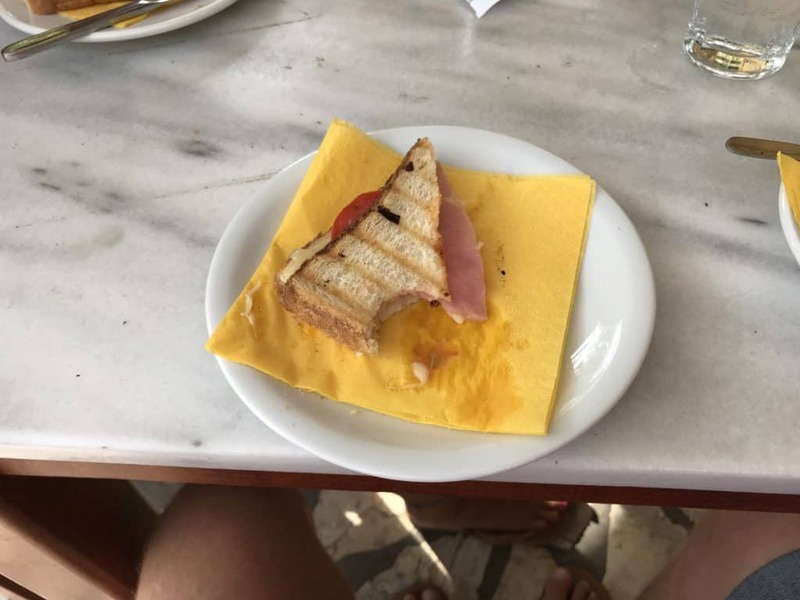 Lunch/ brunch today consisted of a club sandwich and sausage on toast, both with chips which we ate at the bar at the pool – the tables and chairs had already completely dried out. People gradually drifted in over the course of the afternoon leaving it full when we left at 5.30 for drinks on the now completely dry balcony. We both need time to recharge our batteries. This is one of the reasons we are in Paxos. To relax and take it easy. This is very easy to do in Paxos, and especially stopping in Lakka. Everywhere is easily accessible on foot, and there is plenty of choice of places to eat and drink. Basically Paxos is a lovely place to relax and unwind. Another busy day, the only thing left to sort is where to eat tonight. We deliberate on this weighty decision, perusing the menu at Mandis Bar, which is off to the right of the bay in Lakka, giving great sunset views, and is also quieter that other locations with less people walking by. Oh yes, the weather. The sun came out, the temperature increased like an oven being slowly turned up and when we left at 5.30 it was hot but the clouds had come in to seal in that heat nicely for the evening. Back to downtown Lakka. When I say downtown that is a tad of an overstatement. It is overcast, which means there might not be a sunset tonight. We head over to Romantica for more drinks, and manage to get a seat upstairs. Not only do we get a seat upstairs, there is no one else up here so it is just us and the lovely relaxing scene in front of us. And this is when I realise for the first time that you can actually see the mainland of Corfu from the first floor of this bar. I must check to see if I can see the mainland from ground/ sea level – I don’t remember being able to, which is quite unusual for me. Being a photographer I am always looking out for views and always need to know what I can/ cannot see. We have a Mohito each and sit there looking at Mandis Bar, all sad in the cloud and the shade. We have a change of mind and decide to go to one of the restaurants in the square – we might as well take advantage of the cooler weather and light breeze. And Mandis Bar is the prime spot for sunset, so we might as well go there when there is an actual sunset to see. 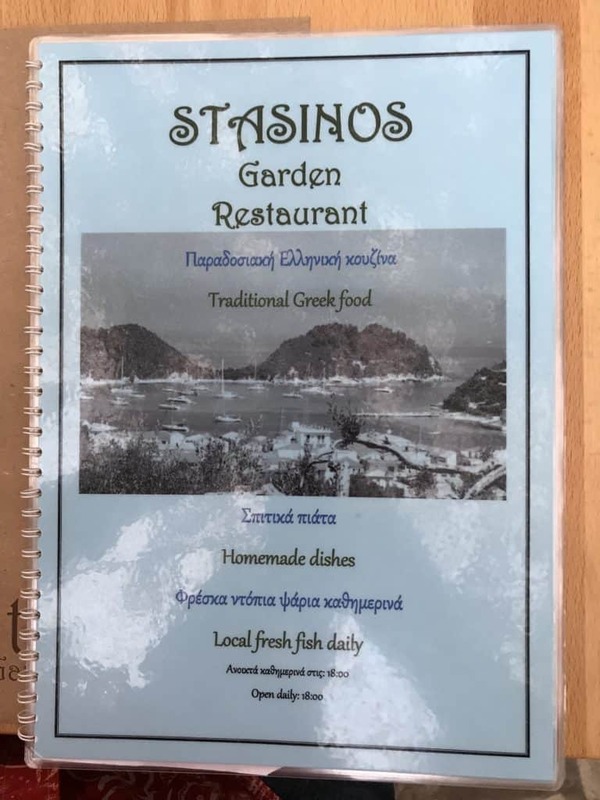 We walk round Lakka checking out the restaurants, and end up in the restaurant called Stanisos Gardens, where we are seated to a nice quiet table by a very friendly and enthusiastic waiter. A carafe of red delivered (a large one it has to be said) we ordered our food. We have eaten here before last year and it was very nice. We went for a Meze starter as we haven’t had one for a while. Nickie went for Moussaka again, and I went for the P beef dish similar to but not Stifado. Honest it is not Stifado. We also had a lesson from our waiter in how to pronounce not only my main course but also stifado – turns out we have been saying it wrong up till now. I cant remember the name of the meal that I had – lets stick with the P beef dish. I am delighted to report that everything about the meal was lovely – the food, the service, the timing, the atmosphere – all good. How much does dinner cost in Lakka? Starters, mains and drinks all for €48. That is excellent value for lots of lovely food, drinks and really friendly and efficient service. Definitely somewhere to return to. A quick word on tipping here. I tend to tip 10% if I have experienced good service and good quality food. If I am not happy I expect every cent of change. If I am really unhappy I try to get a reduction on the bill. I of course round up my tips, so for this meal rounded up to $55, which we were still more than happy with. On the way back to the hotel we stopped at the bakery and got some sweet snacks to have with our Metaxa and also some cereal bars for breakfast. No, we are not ones for staying out late drinking – we are far too old and boring for that. It was an early night for Nickie, whilst I stayed up on the balcony for a while trying to fathom out my other website photosofsantorini, which will be all sorted by the time you are reading this. I had it in my mind that I needed to do stuff, and was really not tired, so a late night working for me. I have switched off in 7 days on Paxos. I have managed to relax and refresh my head and my body. So much so that now my mind is beginning to start working again. Going to Paxos is like rebooting a computer – I have been reset and am thinking clearly again. Blimey, I did not expect that! And with that it is off to sleep with the holiday just about turning the corner of half done, which is a disappointing fact what feels like being too soon after arriving. What else have we go to look forward to then? Now that there has been some serious relaxing it is time for me to get out and do some stuff. Nickie will join me for some of it but some of it I will do on my won. I am going to get up early three or four mornings and go and photography the sunrise. I have a pretty good idea of my locations of choice. Sunrise is my favourite time of day, when I am all alone out and about watching the dawning of a new day. This is a special time for us photographers – a rare time alone to concentrate on taking one photo. Sure, I take more than 1 photo, but that is all I am after. You can read more about this on the post How To Get Sunrise Photos Of Paxos Greece. What else is planned for the rest of the holiday? We have got a hire car booked for two days, and most excitingly a rental boat which we can use to go all around the island of Paxos and also head off down to the lovely tiny island of Antipaxos. This will be such a great day out, and the perfect antidote to the days of doing not a great deal. We can’t travel all the way to Paxos from the UK and just lie by the pool for a fortnight. And neither can we spend two weeks going out and about doing stuff. To be fair on Paxos that would be a challenge in itself. No – there is a balance to be sought, which we have perfected that works for us both together and individually. Paxos makes it easy to relax – it is the natural consequence of being here. And we both take our rest and relaxation seriously. Tomorrow it is time to get back to being a travel photographer – I am going to head off on foot with my trusty Canon 6D and find stuff to photograph – join me on this post which will contain photos taken in and around Lakka. OK – today is the day for the first trip out of Lakka since we arrived. If we can be bothered that is. Gaios or Lakka – which is it going to be? Gaios it turned out was the venue of choice for day 5 on Paxos. We were both looking forward to returning to the capital of Paxos and having lunch and mooching round the shops. Gaios is a lovely place to visit. And as we are on day 5 and have not left Lakka yes I guess it was time. There is dilemma when on holiday of doing nothing or not. Do absolutely nothing and you might as well stay at home – weather being the notable exception to this of course, especially in the UK. And of course the break from day to day life. One day of doing stuff followed by one day of doing nothing other than relaxing works for us. So today is our trip to the big city of Gaios. OK – hardly a big city, but Gaios is the capital of the island. We decided to get the bus to Gaios from Lakka. After our usual morning tea we got ourselves sorted and shuffled out of the hotel – it was already baking hot out there. The plan was to get the first bus which leaves Lakka at 8.50am. Not surprisingly we did not make it, mainly down to me and my morning lethargy. Well I am on my hols, apart from the work I am doing on this website of course. We didn’t make the 8.50 bus so decided to take it easy and get the second bus at 11am. Giving us time spare in lovely Lakka. Missing the first bus gave us time to have a morning mooch around Lakka and grab breakfast at the lovely café called, well I’m not sure! Breakfast consisted of a nice coffee and a cheese and ham toastie sat watching the world go by. It is at times like this that I realise how seldom we take the time to sit down and have a coffee when we are at home – not often enough. Such a simple but enjoyable thing to do but something we do not do anywhere near often enough. Having had a very nice relaxing breakfast we decide to book a table for dinner at a place we have walked past hundreds of times but never been in called Taverna Nionios in the square in Lakka. After all that exertion it was back to the bus stop. Yes – the bus was late – not a big shock but not a problem either. We had the luxury of not having any deadlines other than dinner that evening, so time just did not matter. Well apart from having our first drink in Gaios that is! Should be beer’o’clock when we get there. How much does the bus from Lakka to Gaios cost? 12 euros return for two – that’s not too bad at all is it? You get on the bus and the lady comes and takes your money and gives you the tickets. The bus is old but perfectly fine and clean. 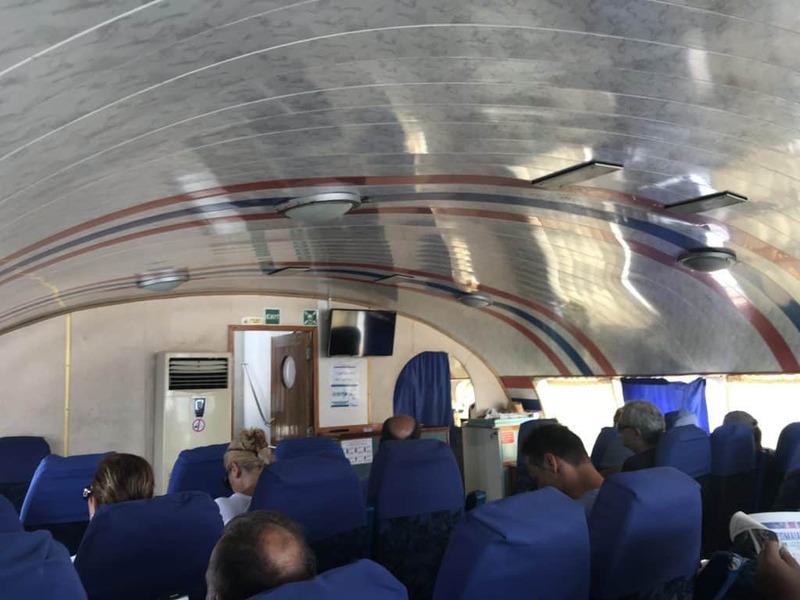 What is the bus journey from Lakka to Gaios like? The local bus from Lakka to Loggos and then onto Gaios is an experience. There is one particular favourite thing of mine after departing the bus station at Loggos. Ok bus stop. Loggos is a small town with shops and bars along the waterfront. And the road is just wide enough for cars to pass. But not wide enough for a car and a bus to pass. It is barely wide enough for a bus to be honest. The bus dominates the road and the entire scene, passing worryingly close to not only the harbours edge but also the tables and chairs on the other side of the road. I did not take a video of this spectacle which is a regret – I was hoping to get the bus again just so I could film this incredible scene but did not get around to that. So I will have to go back! We sat on the front seats on the bus, behind the driver and next to the lady who collects the money and issues the tickets, with the best view out of the enormous windscreen of the upcoming scenery. And there was a local chap sat down at the front whose job appeared to be talking and smoking – not sure how he fitted in! The bus journey from Lakka to Gaios takes about 45 minutes. In Gaios you get off at the top of one of the main shopping streets, also by the main town supermarket, which is the biggest shop in the island as far as I am aware. It was strangely cloudy in Gaios, and very humid making for hot and sweaty mooching. We walked down the main shopping street straight down to the waterside frontage. Well we did not get that far before stopping for a beer at the bar we went to last year. And what a lovely beer it was. The bar is called Cafe Kalimera and is in an excellent central location. We continued our walk down to the waterfront, turned left then took the first street back into the centre of the town. Having just written that I realised that this is detail that you really do not need to know! We bought some nice things in the shops, lovely t-shirts, a couple of pieces of Babylonian jewellery and some stuff for the house. All lovely stuff I have to say. And fairly typical of our holiday shop. The important thing is that we buy stuff that reminds us of our travels and is also stuff that we can’t get at home. When you get down to the waterfront from the bus, if you turn left and follow the path by the sea you will eventually end up at the port of Gaios, a rather low key but perfectly adequate facility. Can’t believe I used the word facility!! We walked all the way to the other end of the water frontage, stopping at Mediterraneo, an intriguing fish restaurant with tables dotted amongst the rocks, which must be lovely in the evening, not that we have been to Gaios in the evening! On the walk there are lots and lots of boats to look at, both moored up and passing through the channel. There are also lots of shops, bars and interesting buildings. It really is a very nice walk. And when you get back to the church at the foot of the main shopping street keep going past lots more bars and restaurants and you get to this statue called Anemogiannis Monument. I will write a separate post all about the things to do in Gaios, along with a selection of my photos of Gaios. And also about my taking photographs on Paxos (ok this was taken on another day). We had the lunch in the main square at Piazza Massa, right next to the Church Analipsi, watching the world go by. Lunch consisted of chicken gyros (with fries and salad) and a pizza washed down with a cold beer sat amongst the constantly growing crowds. This might be basic fare, but this is seriously good local food. The best meal we had in Santorini was chicken gyros! And then in came the boat from other islands, bringing masses of visitors. Our empty restaurant filled in minutes – a complete transformation. The church is a tiny church that receives hundreds if not thousands of visitors every day – it is one of the first things day trippers see as they get off the day boats and hit the land. Gaios is fairly quiet in the morning until the boats start arriving from Lakka, Loggos and more significantly from Corfu and mainland Greece. I have been in Gaios just after sunset when it was ever so quiet and lovely (see the photo above). Just be aware that if you go to Gaios at lunchtime you are probably hitting it at the busiest time. And it stays pretty busy until the day trippers get back on their boats and leave from whence they came. We have not been to Gaios in the evening – something for another time. The streets were much busier, full of tourists shopping wearing swimwear which I always find rather odd! By 3pm we had had enough and decided to get a taxi back rather than wait for the bus back, which was not until 5pm. We wanted to get back for the pool and some late afternoon sun. The taxi from Gaios to Lakka cost 10 euros which was absolutely fine. Taxis drop off and pick up at the bus stop by the supermarket in Gaios – the same place we got off the bus. And it was nice being driven back to Gaios in a nice Mercedes. By 3.30pm we were back at the pool, which was unusually quiet for that time of day. After a nice cool down by the pool it was time to have a lie down and a read, before completing a very pleasant day with a late sunshine beer. I have to say that it was very nice going back to Gaios – the first time we visited was on a day trip from Corfu where we returned on the ferry laden with shopping and a bottle of prosecco. This was our third time in Gaios and each time we have had a very nice time indeed. Back to the room to write this, and then time to get showered (with a bit of shower curtain gymnastics!) and walk back down into Lakka. We spent every evening of our holiday in Lakka. We did debate having dinner in Gaios, or even somewhere inland. But we didn’t. Lakka is so lovely, and we were so chilled that a big part of both of us just could not be bothered venturing into the unknown somewhere new. 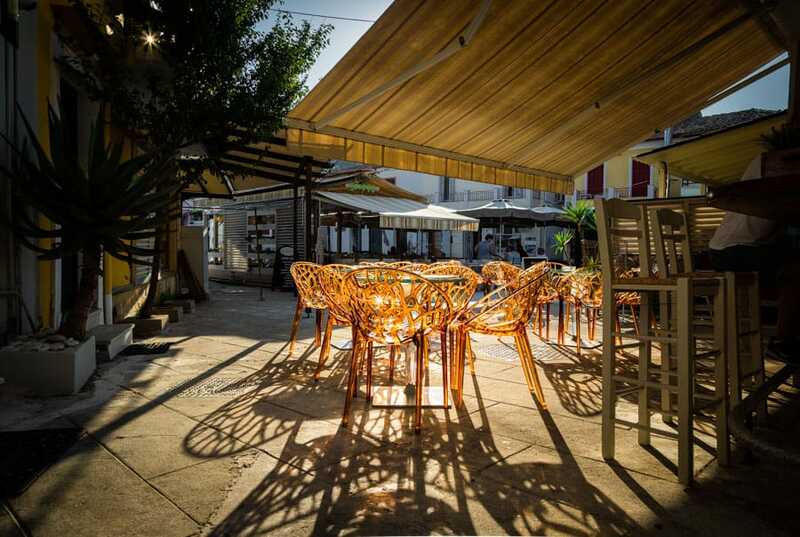 There is plenty of choice of places to eat in Lakka – having spent a total of three weeks in Lakka there are still lots of places to eat and drink that we have not tried yet. There is nothing worse than going somewhere new and finding it rubbish – no we just stuck to the lovely small town where we were staying. If the food was rubbish somewhere we always knew of other places we could go to. And with it being such a short walk down to the waterfront why would we go anywhere else of an evening? We tended to leave the Hotel Bastas at around 7.30pm. It is funny that even with all the freedom of being on holiday and having no time restrictions it turns out we went out at virtually the same time every evening. I guess we are just creatures of habit. Talking of creatures of habit, it was back to Romantica for your cocktails of choice, namely a mojito for Nickie and a Bloody Mary for me. This is the view from our table. Remember the boat on the right! Now I have to say I have not had a Bloody Mary in years, but the ones they serve at Romantica are lovely. We sat in the upper balcony and watched the sun disappear over the hill. Drinks finished, snacks eaten it is time for dinner. We ordered a carafe of house red wine which was chilled and not nice. We asked if we could change the order for a bottle of red which they graciously did. I had stifado. Rabbit stifado no less. An interesting choice, and I am glad that I tried it. Nickie had a lovely authentic (well it would be!) Moussaka. Very nice food and very good service all round – a place we will come back to time permitting. You might have noticed by now that we don’t have many desserts. We struggle between us to eat a starter and a main each to be honest, so dessert is rather unlikely. We often end up sharing a main course having had a starter each. This is met by restaurants with a variety of reactions – we try to do this as nicely as possible. Yes, we buy the odd sweet thing from the bakers in Lakka of an evening. Which tonight was a macaroon and a very sweet but nice local cake. We took our snacks back to our room and ate them sitting on the balcony enjoying a Metaxa night-cap. Blimey – what a long and busy day – there is only one way to get over this – another day doing nothing. What has five days on Paxos done for us? I have switched off from reality pretty well now. There is of course the daily writing and my photography, but these are both things that I enjoy. If my job was doing this all the time it would hardly feel like work. So, 5 days in Paxos has helped us to unwind and relax and be ourselves again. This happened last time, even though we were only here for a week, which is just not long enough. 5 days down and 10 days to go. And having published our planned schedule of activities yesterday there is one thing that I have not mentioned yet which I have to plan into the remaining days. I have not taken my camera out of the safe yet with the exception of that post lunch walk to Arcoudarki Beach. And I have some sunrises to capture. In Gaios today I was reminded of this, and also of the fact that I have yet to work out where to takes photos of the sunrise in Gaios. I have worked out Loggos – that was dead simple. And for Lakka I know where I need to go – well there are a couple of possibilities to be fair. But Gaios is the one that I am not sure about – will this be down by the waterfront, or somewhere else? I have some work to do here before I return to Gaios. And I only have the car for two days, and one of them is for Loggos, so I have one shot at this! A job for tomorrow then is to research sunrise photography locations in Gaios. Day 3 – Sunday. Having spent a day getting to Paxos, and a day doing virtually nothing, it is time to plan to move! What are Lakka Paxos Holidays really like? Today I will continue the theme of resting and recovering on the Greek Island of Paxos. And I will drift into day four where I start to plan the rest of the holiday and get out of the hotel grounds for a bit doing some exploring. I said time to plan to move – well it is Sunday. We can’t rush these things now can we. I woke up at about 9.30. Nickie was up and long gone to the pool. I was clearly going to have a tired day today – I could sense it. Maybe it was the lack of food the day before – I do need my sustenance. If I don’t eat properly I can be quite pathetic. I woke up at 9.30 but couldn’t summon up the energy to get up till about 10 and got myself up to the pool at about 10.30 starving and tired. When I say up to the pool and not down to the pool remember that the pool at Hotel Bastas is unusually above the hotel at the back. Next job was to lie down on a sun lounger for a bit and catch up on the amazing cricket action from the day before in England. Lying down was a tremendous success that I did an excellent job of. I might have forgotten to say that there are toilets below the pool which are a great place to apply sun cream in the shade. More stairs to negotiate. I have to tell you it is not easy being tired!! Lunch was a delight – I had sausage on toast, which was hot dog sausages fried which I split in half and put on buttered toast with lots of ketchup. Nickie had the club sandwich, which was very nice too. Food accompanied by a large beer. I know – I had a beer before any food – well I am on my hols after all! And when I am on my hols my lunchtime beer has an inevitable effect – more sleeping! After all that exertion it was time to lie down again and have a rest. I caught some more of the cricket, luxuriating in the experience of the Apple Air Pods Nickie got me for my birthday. These things are truly excellent, if expensive. They work with just one ear-piece in, meaning that headphone use does not have to be completely anti-social. That and you can double tap the pod to stop what you are listening to, and double tap again to start listening again. Minimal effort which is good, especially on a day like this. I can wear one of these guilt-free knowing that I can converse when needed, when I am awake that is! And this is what Paxos does to you. It makes you unwind. It makes you relax. It is such a lovely, laid back place that I find it impossible to do anything other than turn into a useless unproductive but ultimately relaxed sloth. And that is one of the things I love about Paxos, and the pool at Hotel Bastas. We left the pool early today, with a plan to get up a bit earlier in the morning. Leaving the pool early is 5pm for me. I can stay there till the sun goes down. There is a limit to my slothness, but I am nowhere near hitting that point yet. Back to the room and time for a quick bit of writing on the balcony in that blistering evening heat. This is not the most productive time of the day to write, as I can barely see my iPad screen, and have to have sunglasses on as it so bright. So, what I do is type away pretty much blindly and accept that I will have more correcting to do than usual. Another problem is that when I concentrate on writing I tend to get in a zone, one where I forget that there is a can of Mythos warming up nicely on the table top that you could fry an egg on. Have I mentioned the showers at Hotel Bastas? There is an art to not flooding the bathroom floor, and also to not having the shower curtain clinging to you. I managed to master this on day 2, much quicker than last year, or maybe the showers have improved over the course of the last year. Or maybe our room was better than last year? Air con is on for getting ready to head out for the evening. We head off down to the water again, and this time get to the waterfront and turn right, walking the lovely waterfront to a bar called Mandi’s. They don’t do cocktails unfortunately, which was a shame, so we try the house red which was actually nice and cost a princely 5 euros. The setting is wonderful, sat on a table looking over the harbour of Lakka full of boats and lovely warm flat water. Starving having had a sausage sandwich/ club sandwich and some crisps we walked back and took a lovely waterside table at the restaurant called Arriva. As we were so early we caught sunset at the restaurant while we were having a drink waiting for our food. I was convinced that it was going to be a stunning sunset, but it turned out to be quite a non-event. Oh well. I have mentioned this before though, so I won’t go on here. A basket of bread to start with. Basket means 4 slices by the way in case you were thinking of like a large basket! No photos yet of the food – I have not got into full flow yet, but they will come don’t worry! No starters tonight, just the bread then into the main courses. I will let you into a secret here. We seem to struggle with a starter and a main course each. We cannot manage to eat both, so end up either skipping starters or sharing a main. Is this an age thing? We often look at the sizes of portions of food that people eat with amazement. And sometimes when we are sharing a main course we cannot even manage that. What did we eat – finally! Tonight, I had the traditional Greek dish, stifado, and Nickie had pasta with prawns in a cream sauce. All rather nice. An amusing thing about Paxos and the waterside tables is that there are fixing points for boats all along the waterfront, so when you are sat there one of the small RIBs from one of the big boats could appear and tie up at your table. An Italian couple appeared, but they moored up at the next table, got out of the boat, did a bit of shopping, came back, put the shopping in the boat then sat down to eat. We were shattered so went back to the hotel and fell asleep with the air con on. Nickie woke up at 3am again and turned the air con off and opened the doors – I obviously did not feel the cold as I was fast asleep. Today is the day for planning stuff to do. I said planning to do stuff, not doing stuff. I need to get on with this holiday in Lakka – we have travelled a long way and there is lots to do. I set the alarm for 7am, got up, put the kettle on and then went back to bed and fell asleep. I got up again a little while later and we had two rather strange fruity Yorkshire teas and took coffees up to the pool, where I started writing this bit about yesterday. Remember the travel cups from going to the airport? This is where they were (not being dramatic here) a virtual lifesaver! I had to plug my headphones in to block out a naughty child’s name being repeatedly shouted out by one of the parents in an otherwise completely silent pool area. 9 am at the pool you can sit in sun or shade – it is entirely up to you. I sit in the shade to write – apart from that I am in the sun. Why travel all this way to sit in the shade? Today (Monday) – book stuff to do. I know that involves effort! We shared an excellent full English breakfast with coffee, toast and fresh orange juice – 14 euros. We finalised our plans and then went and did our bookings. We got the hire car from Babis at the hotel, and the boat from Sam the Olympic Holidays rep. The timings didn’t work out quite as planned, we got the car for the Tuesday and the Wednesday, and the boat for the Sunday. Day 4 – Today (Monday) – book stuff to do. I know that involves effort! Day 7 – Thursday – no car – to be decided! Day 8 – Friday – to be decided! Of course, when you are on holiday whilst it is nice to have a plan it should be too rigid other than actual bookings! This all worked out fine though and gives us the variety we need. And that essential last day of doing nothing. Whilst ordering breakfast we found out about a path that went around the back of the bar that it turns out took you to the beach. After an hour of reading I went off for an explore, armed with nothing more than my phone, a 20 euro note and my t-shirt. 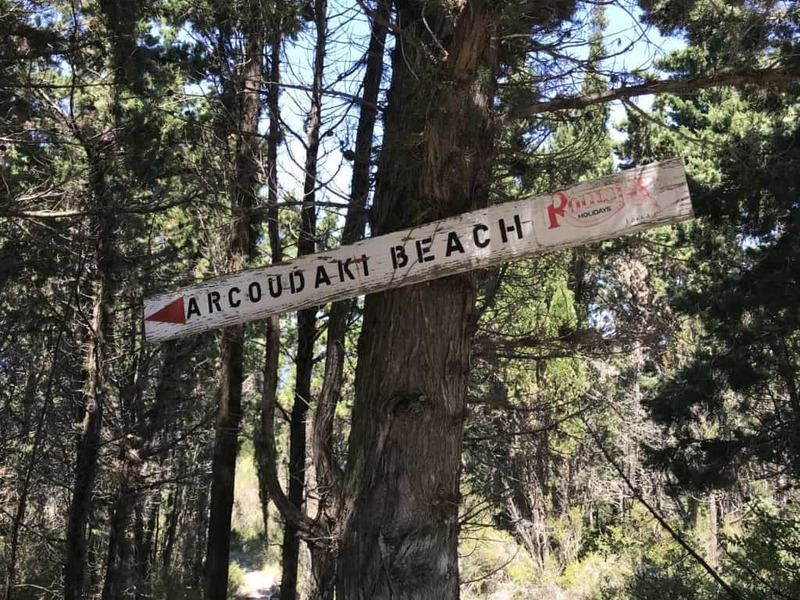 I eventually made it to Arcoudaki beach (insert photo of the sign), having mistakenly wandered onto a private estate and being shouted at by a local lady, to who I apologized profusely. This beach was shall we say small and rocky. I went in the water up to my knees then regretted doing that as it is impossible to walk with wet flip flops, so I sat on a rock for a bit and waited for everything to dry. Which took about a minute. Accompanying me on the beach were too men and a woman with a golden retriever. There was nothing there at all, no bar, shops. Off I then went to the next beach, navigating using my instinct and Google Maps on my phone. I could barely see the screen in that ever so bright sunshine, but I made it there after getting lost a couple of times. This was a walk inland, not along toe coast in case you were wondering. An interesting beach, with an eclectic mix of Italians and English upper classes – it was like something from a Hugh Grant film! And there was a house on the beach that apparently belongs to the former footballer Bruno, who used to play for some famous football teams somewhere. I am sure I saw him. There is a sign at the entrance to the house saying private house, but the number of people in there made it look more like a bar than a house – very strange and confusing. The beach was pebbly with no facilities but a lovely place with crystal clear waters and lovely views. I walked back in the searing heat regretting not bringing any water. I got lost three times but made it back to the hotel in 21 minutes, not bad considering. And I didn’t offend any of the locals on the way back which was good. A quick dip and then a salad for lunch with Nickie, accompanied by a most welcome beer, then it was time to cool off in the pool before settling down to crack on with The Russia House, which I am reading on my Kindle. I started reading this book over Christmas and am determined to finish this in the first week so I can start a new book I have. I checked my emails, nothing urgent that needed dealing with, and then the iPad was off again until the next day. Well until I got back to the room to write this. Now I am having a beer on the balcony completing this section of my daily journal, before we head off down to Lakka for cocktails and dinner. An altogether lovely way to spend a day in lovely Paxos. We went to the bar on the waterfront for cocktails, but they didn’t have any mint, so Mojitos were off the menu. They wouldn’t have any for a week apparently – small island life! We tried their alternative, which was too sweet. Back to Romanticos we went, where they had the full recipe for mojitos Thankfully so all good again! Then it was down the road to the number 1 rated restaurant in Paxos, Paxomadi. Service was at island pace, but the starter of baked feta cheese was excellent and very filling. The house red by the carafe was nice too. They were clearly very busy, and possibly understaffed, so the service was hit and miss. Mains were ok – prawn saganaki and roast chicken and fries. We had the same problem with being full of starters and bread, unable to eat our main courses completely. We had a drop more wine before heading back for a night’s rest. I think that this eating thing is not helping with our restaurant experience! In the last post I described getting to Corfu from the UK. 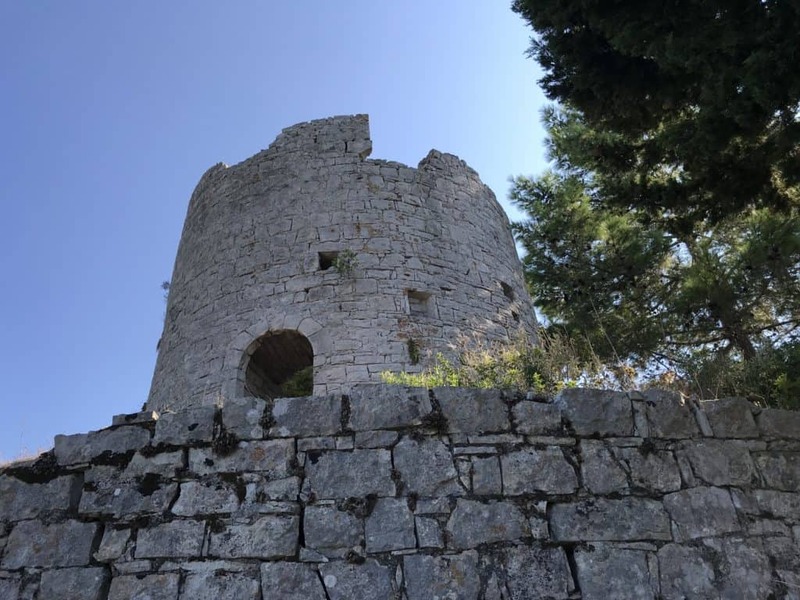 And now we are onto the interesting bit – Paxos Greece Holidays – Part 2 Day 1 – Corfu to Paxos. This is the bit about getting from the New Port in Corfu to Paxos, and on to the hotel. And I might get into some day 1 holidaying if I have space. Getting on the ferry is interesting. All the luggage is loaded on first and then stacked about 8 cases high. I am sure this is what happens at the airport, the difference is that here you can see it! Of course everyone is very keen to be first on the ferry to get the best seats, so everyone gets in the way of this process making it take longer. Once all the luggage is on people jostle for position to get on first, You show your tickets and then on you go. Unfortunately the Iliad 2 is a closed ferry apart from what is best described as a corridor between the enclosed parts. This is the only fresh air you can get onboard. I say fresh air as it is the only place that people can smoke! We had an eclectic mix of fellow passengers, a woman with a cat in a basket crying all the way (the cat not the woman), an Italian man face timing someone with volume turned up to 11 to compete with the noise of the engines. There was a woman with a dog, and a local who knew all the boat crew it seemed. As I said you have to sit inside on this boat, but I spent most of my time standing at the open rear door while Nickie tried to get some rest, which was virtually impossible in that blistering heat. The back of the boat is gasper alley for the crew, and also a place for them to take a well earned break! You get lovely views of the island of Corfu as well as mainland Greece as the ferry speeds its way south. One hour later we are in Gaios, where we are met by Babbis from the hotel, with whom we had pre-booked a pick up from the ferry. A very pleasant 15 minutes drive later, with lots of house-keeping things being sorted on the drive, and we arrive Hotel Bastos. Cold water is provided en route which is a very thoughtful touch. Check-in takes minutes, and then we go to room 26, on the second floor at the middle of the front of the hotel. It has a lovely balcony, great for evening sun. Having stayed at Hotel Bastas the previous year we knew which room we wanted when made the booking, which was direct with the hotel this year. And this room was bigger than the one that we had last year, which was the corner one closest to the sea but on a corner making the room much smaller. Our room this year had a much larger balcony with a table and chairs. OK – are back at Hotel Bastas, and it feels very good to be back. The rooms are not luxurious. Lets get this out of the way. The rooms are basic and a tad rustic, but are absolutely fine for a two week stay. There is a bathroom with a sink, loo and shower. The bathroom is compact, and there is a knack to showering without the shower curtain clinging to you! There is a tiny kitchenette arrangement, consisting of a fridge, sink, kettle, toaster and basic cutlery and crockery. Most important thing here is the fridge of course, for water and beer. And there is a corkscrew. The bedroom has a small TV – no idea what the picture is like or what channels you can get as we never turned it on. There is a nice bed, plenty of storage space and an air conditioning unit above the doors to the balcony. So that is the room. As we had just arrived we unpacked quickly and then headed down to Lakka to get supplies in. We unpacked straight away, then headed down to the shops for essentials. These provisions are not cheap, but when you are on holiday and spending with Euros it tends not to register. The reality of the cost of living abroad hits me the first time I find that I have to go to the cash machine. And moreso the second time! When you know that you took out £250 in Euros two days ago and it has all gone is a bit of a reality check! Shopping done – just got to carry it back! Having done the initial shop it is time to get back to the room. As we always buy bottled water in packs of 6 I end up having to walk in flip flops up two floors of the hotel with 9/ 18 kgs water to weigh me down nicely. Not easy especially when the sun is still kicking out later afternoon rays of glorious sunshine! Which is why I often do a water run in the morning before the sun has risen over the hills to he east of the hotel. Then it is back to the room all jobs done and now it is really time to kick into holiday mode. We start with a quick drink on the balcony adjusting to the sweltering heat, have quick showers and the walk down to the waterfront of Lakka. It is absolutely lovely. 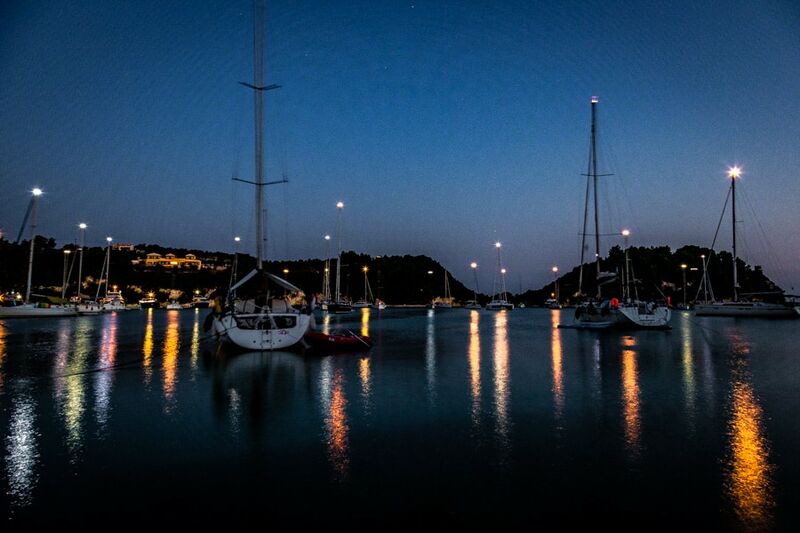 There are bars, restaurants and shops along the waterfront, and the is littered with lots and lots of lovely boats which all have lights on the top of their masts – I will come back to that at another time when I share one of my favourite photos of Lakka. We stopped at the Harbour Lights bar which does 2 for 1 cocktails. 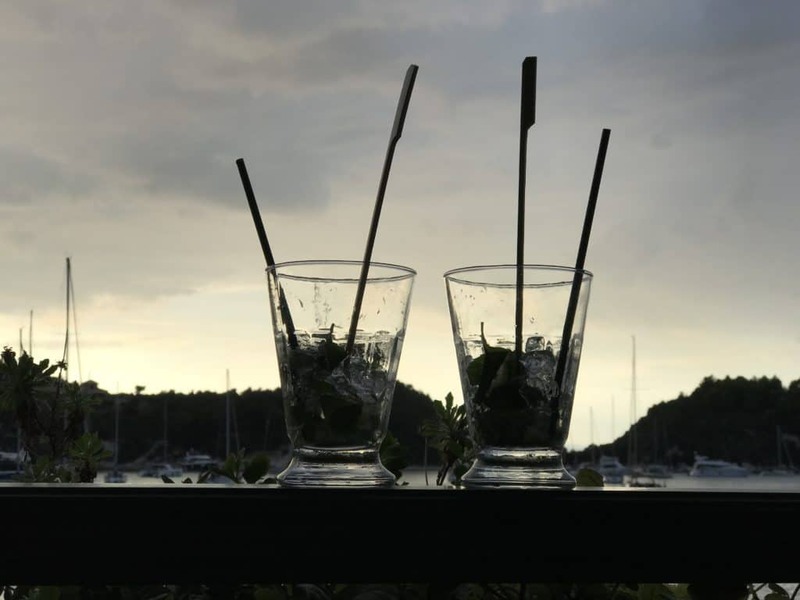 We each had a lovely refreshing mohito and sat there chilling out and enjoying just being together and back in Paxos. The problem we often find is where to eat? Well for our first night we chose the fish restaurant called Akis. And it was not the best meal. I think that this may have been down to your meal choice to be fair to the restaurant. We are not fish lovers, so why did we go to a fish restaurant? Because it looks lovely and is located in one of the best spots on the waterfront in Lakka. I am sure if you are a fish lover that you will have a fantastic time. And with that our rather long day was over. Having woken up in Bournemouth we went to sleep on Paxos. Day one over and time for sleep. The only decision to be made here was balcony doors open or closed with the air conditioning on. We went with the air-conditioning on to give us a chance the next day to get acclimated. And at 3am it was freezing. Time for plan B – doors open and air con off. That worked just fine, as being on the second floor we benefitted from a gentle cooling breeze which took the edge off the heat just enough to be comfortable. Day 2 – Saturday – the art of doing nothing. 10.10 we woke up naturally – no alarms required on the first full day on Paxos. We had a meeting planned for 10.30 to book all the things that we wanted to do -we didn’t make that of course. Instead we drank tea and came round slowly. Talking of tea, the Yorkshire Tea we brought from home had a funny taste to it. It was called Breaktime tea – not Breafast tea. It turns out this tea has flavors of orange and lemon, not that great but better than nothing. Why would you do that to a decent tea? We got up so late we didn’t bother with breakfast –we just got ourselves sorted and shuffled off to the pool. Hotel Bastas has a great pool. It is located above the hotel to the back nestled nicely in the side of the hill. You are serenaded all day by the sound of crickets, which helps to mask the noisy people. I have even written a post all about hotels with pools on Paxos so inspired was I. Armed with sun cream, water and Kindles we clamboured up the steps and over the bridge to the pool which was nice and quiet. Brunch consisted of a Greek pizza and a tuna salad, washed down with a couple of beers. And now it is time to rejoin the human race! After showers it was back down for some cocktails. This time we went to the bar called Romantica, where I had a Bloody Mary and Nickie had a Mohito. Our bar of choice – Romantica. This bar is right on the waterfront, well there is the path in front of it but you are looking directly at the sea. And even better this bar has an upstairs balcony, which is great for catching the sunset which takes place over to the left behind the hills. There are three hire boats moored directly opposite the bar – more on those later on in another post. And the staff are really friendly and helpful so all in all our favourite place for drinks, which are always served with a bowl of crisps. Are the sunsets any good in Lakka? No not really is the brutally honest answer. Well that is me speaking as a professional photographer here. It is all to do with the topography. Lakka is obviously down at sea level and surrounded by hills on three sides. This tends to take the edge off sunrise and sunset – you don’t get that bit where the sun and the horizon meet, which is where the magic happens. I will be writing plenty more about photographing the sunrises on Paxos in other posts, as well as sharing some of my sunrise photos taken oat other locations on the island. I am more of a sunrise photographer than a sunset one – sunset impinges on a more sociable time. But sitting on the balcony at Romantica sipping a mojito with my gorgeous wife is an absolute joy – such a lovely time. So nice we had another round of cocktails before getting some food from the bakery and eating on the balcony drinking Metaxa and taking it easy. There is a lovely bakery in Lakka right down in the centre of the town. I say town – it is more like a village than a town. The lady who served us barely spoke to us the first night, but don’t worry we broke her and she ended up being lovely to us on return visits! We always try the local food in local bakers – there are some lovely local foods that you can get such as spinach pies and cheese pies. I am not a sweets person but I did enjoy some of the takeaway sweet stuff that we had. The evening temperature was still pretty hot but sat there and enjoyed our snacks and Metaxa before turning in for the night. What did we have planned for tomorrow? The same as today. Only more of it! This is how we roll!! A word about the climate in Paxos. I wanted to mention here the climate in Paxos in August, and also the environment in and around Hotel Bastas. I hace actually written a separate post titled When Is The Best Time To Visit Paxos? which tells you more about this. Our room was on the front of the hotel. In the morning it is in the shade, and a lovely place to sit and have morning coffee. As long as the neighbors aren’t chugging away on gaspers that is. Next door had three cigarettes in half an hour which was pleasant for us. So, the mornings are lovely and cool in our room in the morning. At some unknown time the sun works it way round to the front of the hotel. I say unknown time as who in their right mind would be n their room on a Greek Island around noon? When we get back to the room there is one decision to be made – in with the air -on or out on the balcony in the blistering evening sun. I go for out in the blistering sun every time. And that is one of the two places where I wrote this diary of our holiday. Everday I would sit down for half an hour and write about what we had done that day using my iPad. Why was I writing when I was on holiday? I knew I was going to be creating this website, and wanted to capture everything that we did on a day-to-day basis. This would save me time later and also mean that I did not forget anything. What’s is really like getting to Paxos? Well last time we went to Paxos I wrote a daily diary. Paxos Holidays – Part 1 Day 1 – Getting To Corfu From The UK. This is the beginning of journey. In this post I will tell you all about getting to Corfu from the UK, which is the first leg of the journey. In the next post I take you from Corfu to Paxos. How we are getting to Paxos? We were flying from Bournemouth Airport to Corfu, and then had to get across to the port to catch the ferry from Corfu to Paxos. You can read all about how to get to Paxos in a separate post. The alarm was set for 3.30am. That was a bit of a shock. It’s funny how things work out. A relaxing two weeks in the sunshine on the wonderful Greek Island of Paxos starts with getting up at 3.30am on a Friday morning! Yes it’s a Friday morning! But whilst it might be an early start it is for the best of reasons! All we had time for was to grunt good morning to each other, drink a cup of tea (how very English I know), get up, finish packing and make coffees for the drive to the airport. Oh yes and get dressed. Always a tricky one that – what to wear flying from the UK to a much warmer place? I went for shorts and t-shirt – dress how I intend to arrive. Flip flops are a bit too much for me though, especially sat in the back of a taxi at 4.30am. Side point here (there will be lots of these) – the travel cups will turn out to be a genius addition to our packing. Our taxi was booked for 4.30am. At that time of day it is a 20-minute drive from home to the airport, which is to be perfectly honest luxury! The driver was wide awake happy and chatty but realised quite quickly into our journey that we were not in chatting mood so left us to it which was nice of him. We use Airport Cars who are very good. It was the first time I had gone from home in Poole to Bournemouth Airport via Wimborne, but we still got there in less than 20 minutes which is great. And a shortcut for me to remember the next time I have the misfortune to be queueing on the A31! Bournemouth Airport is tiny, which is great. I love how they call it Bournemouth International Airport, as though we would not get the International bit, it being an airport and all that! They may have dropped the international bit from the name thinking about it. We did not have seats booked this time but managed to get two seats together at what appeared to be the back of the plane. This could be a good or a bad thing. And there is the unknown in all of this – what will the people around us be like?? I put the bags on the scales, and not an eye was raised when both our bags weighed 23.1kgs which was good. Very good. At other airports this has been a problem causing the usual farce of re-packing heavy stuff from the main hold luggage into the hand luggage. I have never understood the point of this – this stuff is all going on the same plane after all! In the past I have even resorted to putting a lens in my coat pocket, and of also hanging my camera around my neck to “reduce the weight”! Check in queues are much less than at Gatwick, and once checked in the walk to security is, basically, a walk to the other side to the other side of the room! Next is the hand luggage through the X-Ray machine, which for the first time in a long time I was not stopped at. I normally get stopped at security. It might be my face. Or the fact that I have a Canon 6D with lenses and batteries, possibly a dive computer and also my iPad and iPhone. I think that this heady combination of electrical stuff sends the scanning machine into overdrive! We were stood waiting for our plastic trays with our stuff in – there was no sign of them which is always a slight concern!. We saw them on the opposite side of where we were stood and thought that they had been selected for invasive investigation – turns out there are two X-ray machines and out stuff went through the other one for some reason. Panic over, and no need to empty and repack my hand luggage, which by the way is my Peak Design Everyday Backpack. You will come across this again in future posts. And so, the holiday begins! Some say that their holiday begins when they put the luggage on the conveyor belt and watch it magically disappear to be miraculously reunited with you in another country. For me personally the holiday begins once I have got through security. I find myself virtually getting dressed again as we walk through the duty-free shop, with my phone, wallet, watch and small change shoved in an alien pocket for the X-Ray machine whilst I struggle to get my belt on. Ok once my belt is on now I can begin my holiday. Does anyone remember smoking seats on planes? Seems absolutely ridiculous that not that long ago you could smoke on a flight. Another recent change at airports is the duty-free shop. Have you noticed how at airports these days once you get through security you are straight into the longest meandering shops on the planet which you have to walk through to get to the bar for that traditionally inappropriate early morning pint. Having made it through the extended hike that is the shop we went to the restaurant – yes there is only one – and found a seat in a quiet corner – perfect. That is the quiet corner where the family with loud kids appear and sit either side of us. Not that I have anything else against families and small children – I was small once and also a child. It is just that they are rather loud at that time in the morning. Perhaps there should be a child free area, or even an over 50s area, or even better an area where passengers are invited to be quiet. In the lounge we go to at Gatwick there is a room called the Library – and guess what? I had to ask to American gentlemen to be quiet as they were talking at full volume in there. For you youngsters reading this take note – this is what you have to look forward to! It is 5.15 am – time for a drink and breakfast. Filter coffee x 2 and one full English breakfast – £14. Not too bad to be fair. And no, I did not have a pint – I am getting a bit old for that! On to the food. The first offering consisted of one overdone egg, one underdone egg and bacon that looked like it had been poached. So that unfortunately went back, and the second attempt arrived some time later which was ok. And then we tried scrambled eggs on toast, which was not great. The important stuff – drinks! The next job is buying drinks for arrival – wine and a bottle of champagne for our wedding anniversary which we celebrated on holiday. And then the inevitable final mandatory call in the airport shopping experience – WH Smith. Such a great shop, and the only time I ever buy a newspaper, which I inevitably don’t get around to reading, along with the free bottle of water and the last-minute panic buys. You know the stuff you can’t get at your destination like mints and crisps. And of course, the contingency sandwich. And at this point all that careful planning of the contents of the carry-on luggage are compromised by a plastic bag from WH Smith. After all that it is time to check in – this is one of those funny things about Bournemouth airport – the same lady who checked us and our luggage in and issued our boarding cards has now been redeployed to gate check-in duties. After that no doubt she will refuel the building, fix the roof and check the ticket machines in the car parks before nipping off to Asda to get more supplies in for breakfast. Which reminds me of something that has bothered me for some time – why Bournemouth Airport do you charge £2.50 just for people to enter the car park? The lady who checked us in was miserable and grumpy, but very efficient with no irreverent back chat – enjoy your holiday etc – I like that. I wish more service staff were honestly as grumpy as they felt, which is much better than showing false interest in where you are going etc. The lady who checked us in did not wish us a wonderful flight – I have no doubt she did not give a stuff if we had a nice time or not, so no pretence from her – just efficient misery. And good on her. Maybe this is because I am a grumpy git, or just that I hate fake niceness. And finally, it is time to get on the plane. I love this bit. Yes, I have done this many, many times but I still love getting on a plane. And the plane is a lovely shiny new Boeing 737-800. And yes, we are sat right at the back of the place. The chap sat next to us doesn’t look like he has any intention of communicating with us in any way at all – not even a grunt of acknowledgement. But this of course is fine! Why are the overhead lockers packed with flight stuff? Surely the overhead lockers are for us, not for stuff for the plane? Not for the first time all the overhead lockers were full, so I had to give my bag of drinks to the cabin crew who put is somewhere to give me a challenge on arrival to find. Sitting at the back of the plane is very noisy as it turns out. You feel everything. Not the best place to sit, but we took off and enjoyed the views of Poole Harbour, Brownsea Island and Sandbanks. And then we were in cloud. We took off at 7am, which if I switched my watch to Greek time made it 9am – is this too early for a beer? Why do we think it is acceptable to have a beer at 7/ 9am when we are going on our holidays? It is a strange phenomenon. If I had a day off and started cruising for Heineken at 9am I would be most concerned. But stick us in an airport and the rules change. For the record I managed to hold on till 9am UK time, which is 11m Greek time which is just fine! On the flight we bought some inevitable product, and I treated myself to a new watch. It is a Citizen watch which is pretty cool and there was 20% off the already discounted in flight price. So they say. Last year I bought a pair of Superdry sunglasses, probably just because they were on offer. They were hideous to be honest, and the day they snapped in half across the nose-bridge was a good day! I spent the entire flight with my Peak Design Everyday Backpack between my knees and the lady sat in front of me decided to recline her seat leaving us virtually no room. But thankfully it is a short flight. 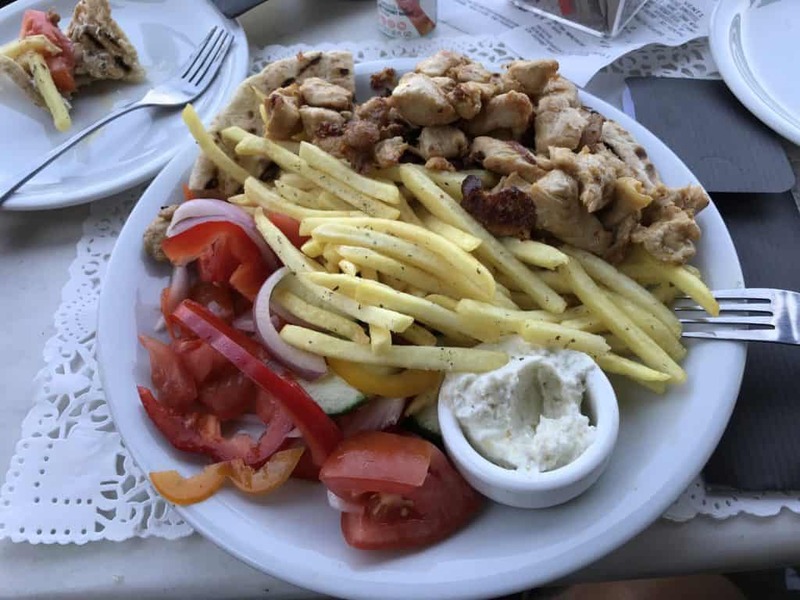 We don’t eat on the plane, as we know that we have a wait at the port for our ferry so our next meal will be probably be chicken gyros on Corfu! The rest of the flight passes peacefully, and then we land. It is only a three-hour flight from Bournemouth to Corfu. Landing is a bit bumpy at the back of the plane, but we are down safely. And now I have to find my hand luggage. The bag with the drinks in, not my camera bag. My camera stays with me at all times. We get off the plane and get hit by that wonderful heat. And the smell of the air in a foreign country. There is no feeling like this, and such a wonderful thing to experience. And that bright Greek sunshine of course! We have arrived at our first destination, Corfu. And it is so good to be back. Some airports can be a nightmare. Corfu thankfully is not one of them. Certainly not arrivals which is very slick and hassle free. We glide through passport control nice and quick and then wait for our luggage. The bags are out pretty much straight away. I have to be honest here though – I was stood at the wrong carousel to start with but don’t tell anyone. I think my wife might be aware of this though….. I did a very English thing and followed other people from our flight to the wrong carousel. Strangely a member of airport staff came and told me that I was at the wrong carousel -– how did she know that? Out of departures and straight across from the exit to the left is the taxi rank. We got a taxi straight away to the New Port, which costs us €15. We made the mistake of not asking how much beforehand which was disappointingly naïve. But it turns out it is a fixed fare anyway so not a problem this time. 20 minutes later and we are the New Port. We picked up the tickets from the agent across the road from the port, and at 1pm local time sat down at the bar with a nice two hour wait for our ferry at 3pm. This is why we did not eat on the plane! It does seem bizarre after all that activity suddenly stopping, having time to sit down and relax in the Greek sunshine. Not that long ago we were in Bournemouth, and not that much longer ago we were at home. Chicken gyros at Sette Venti – very nice! A few beers and an excellent chicken gyros gave us sustenance before we got on the boat for Paxos called the Iliad 2. I went to check if our boat was in, reported back to Nickie that it wasn’t. And then she went and had a look and the boat that I had said wasn’t ours actually was. And with that I will sign off for now – in the next post I will describe the second part of the journey, from Corfu to Paxos. Did We Discover Paxos Greece? Yes, But Now it’s Time To Go! Paxos Mobile Phone Signal – And What About WiFi? Paxos Hotels With Pool – Essential For The Hot Summer Months! Paxos Airport – everything you ever need to know guaranteed!